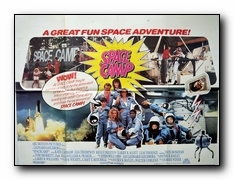 Lobby Cards, like movie posters, are promotional materials sent to movie houses and theaters for use in advertisement displays. 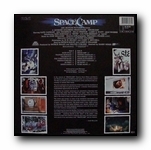 These cards, as their name suggests, are smaller posters (generally 11" x 14"), printed on card-stock, and usually in sets of eight, each featuring a different scene from the film in question. 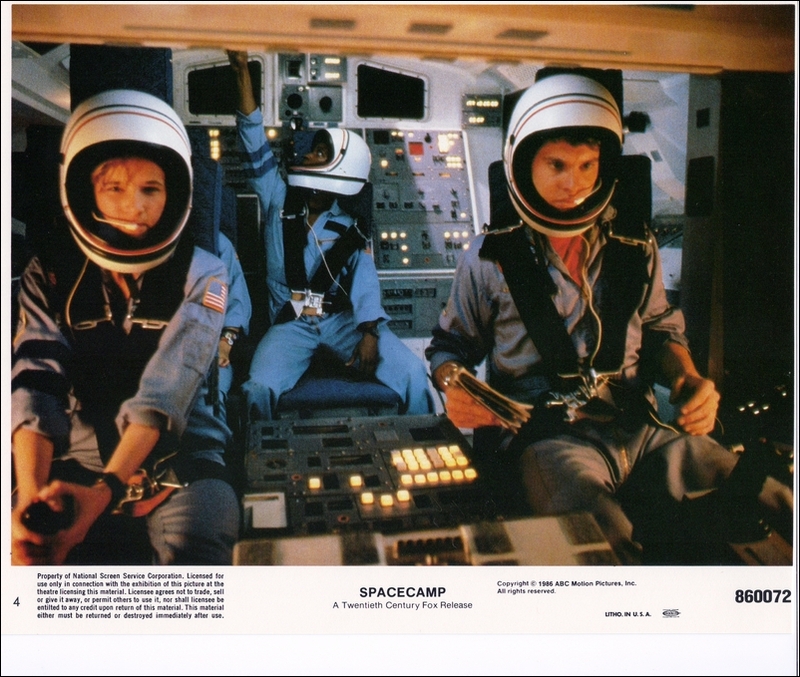 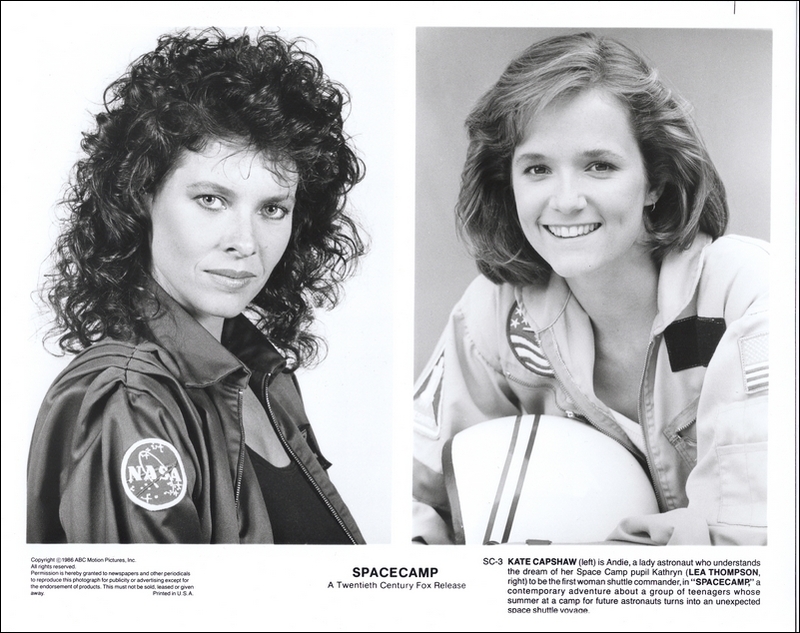 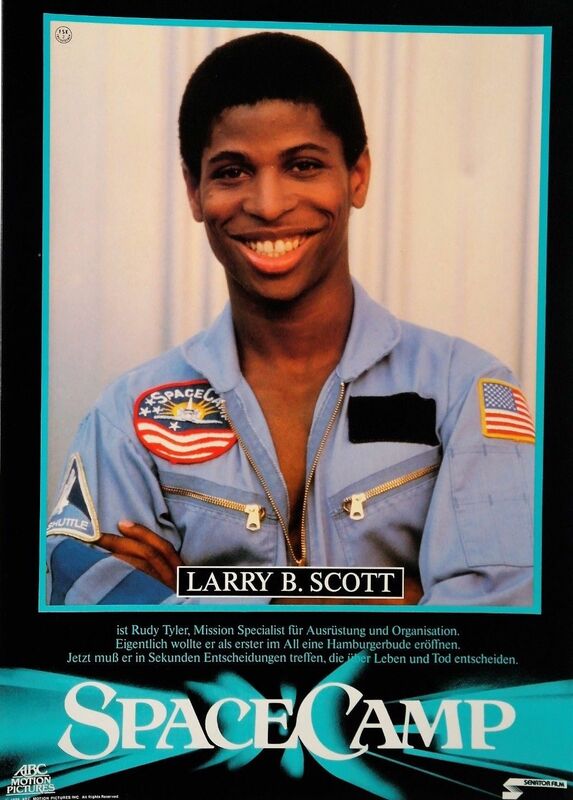 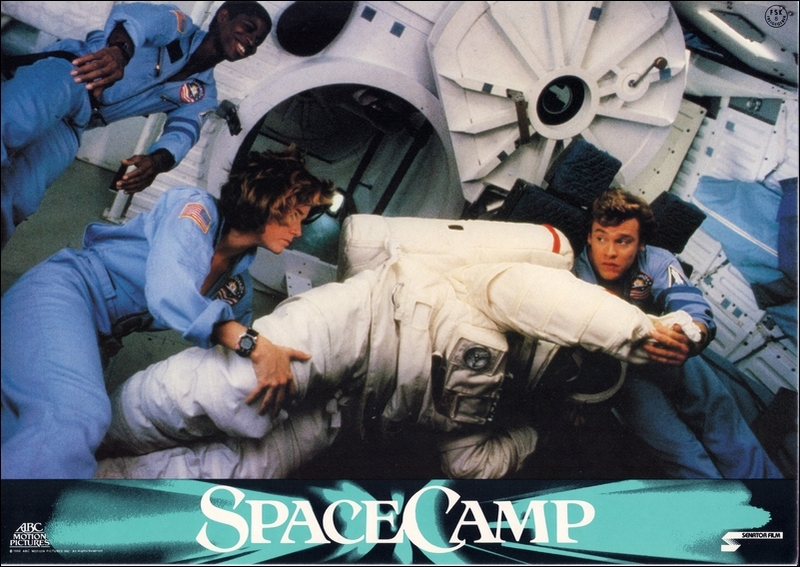 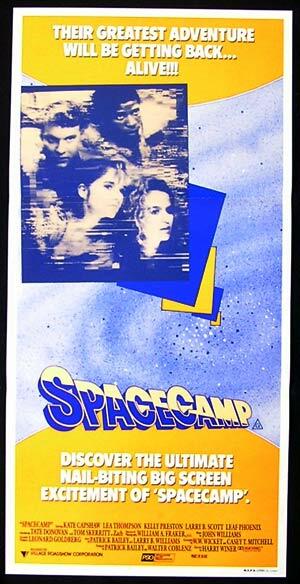 The Lobby Cards for SpaceCamp: The Movie followed this convention in the United States with these cards. 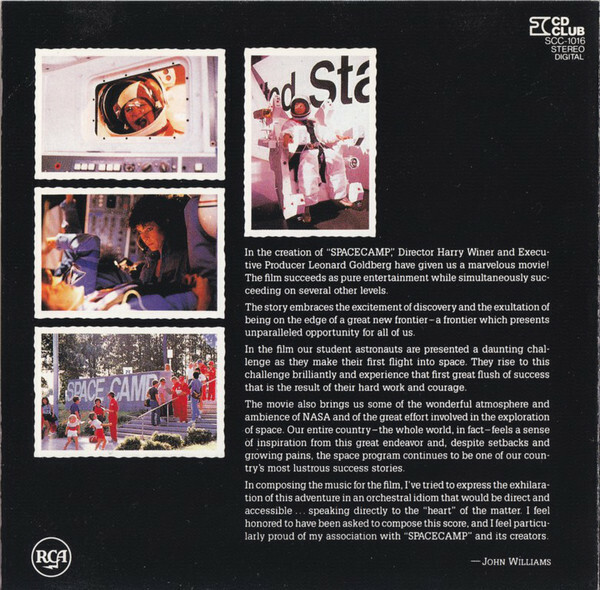 Note they are copyrighted by the National Screen Service Corporation and were supposed to be sent back to 20th Century Fox (the film's distributor) to be destroyed after the film left theaters; however, some have remained in the hands of collectors and survived. 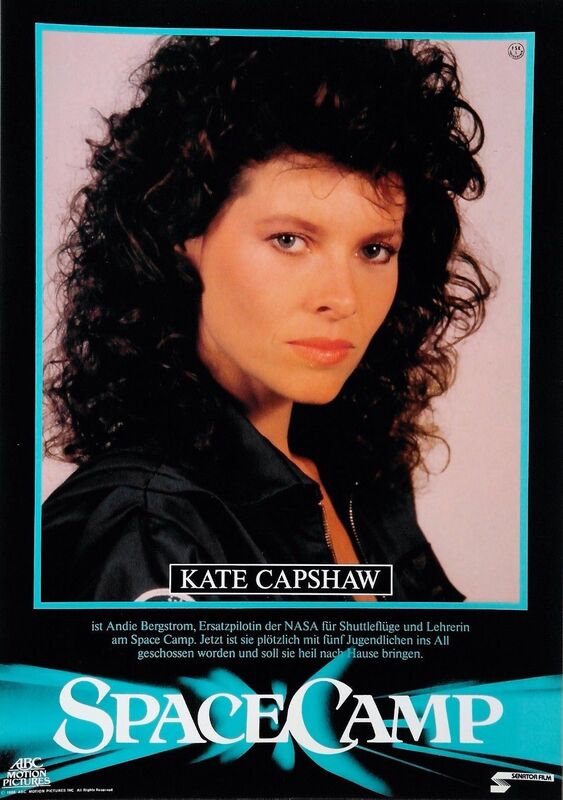 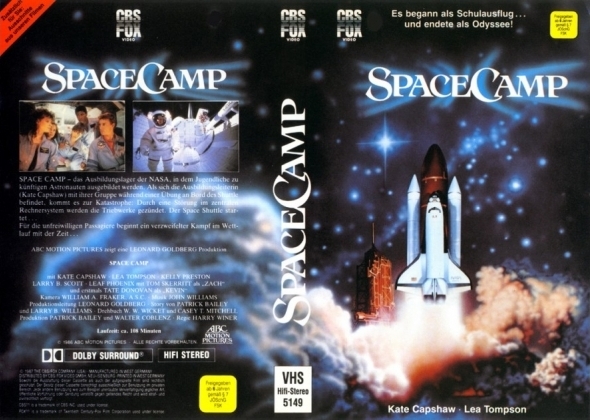 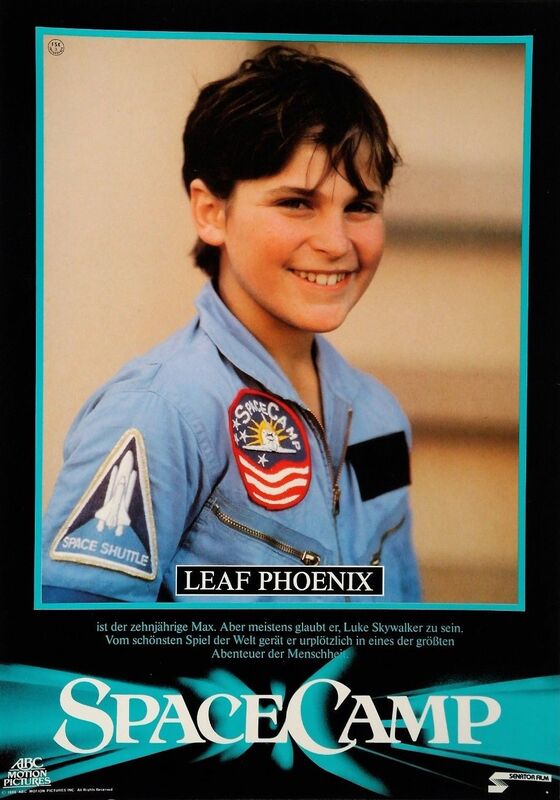 The Lobby Cards for SpaceCamp: The Movie in foreign markets, especially these from Germany, conform to a different standard. 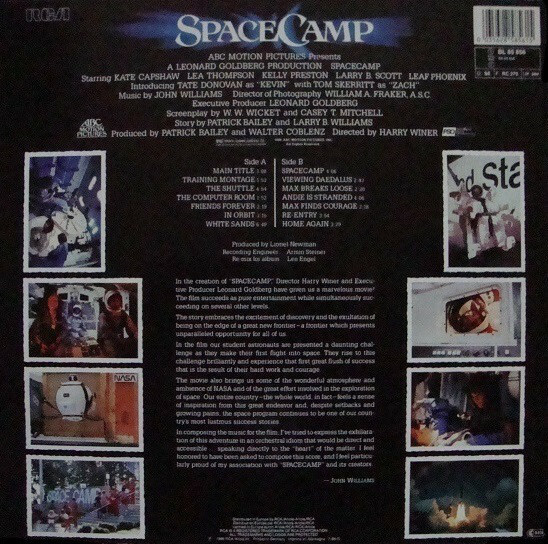 Although still showing scenes from the film (some of which re-create those seen on the US Lobby Card release), they are in a different dimensional format and paper composition. 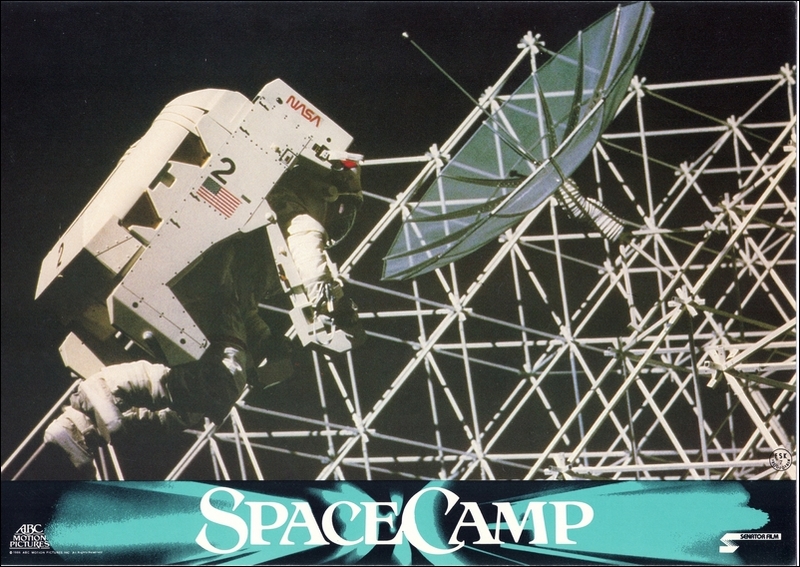 These cards are akin to regular printed paper, semi-glossy for photographs though, rather than card stock and quite flimsy. 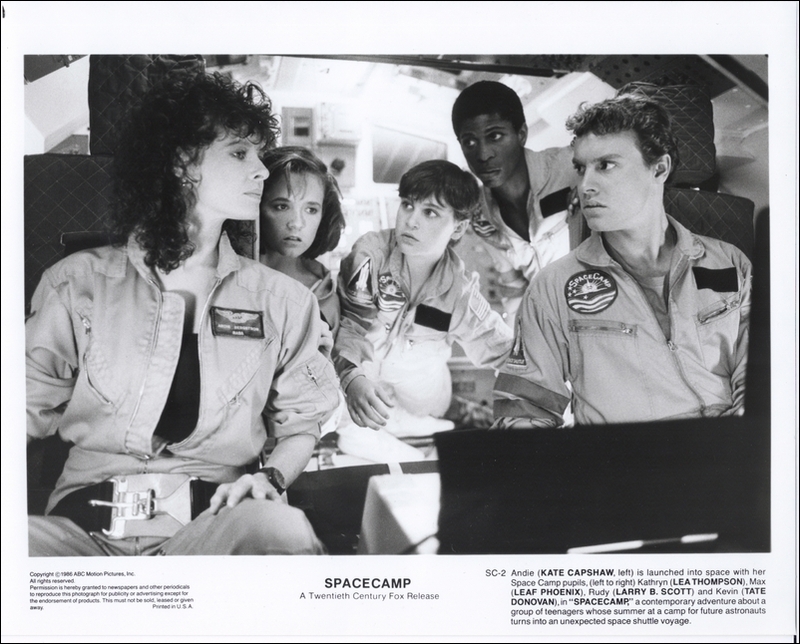 They, like their American counterparts, were also to be sent back to the film's distributor to be destroyed. 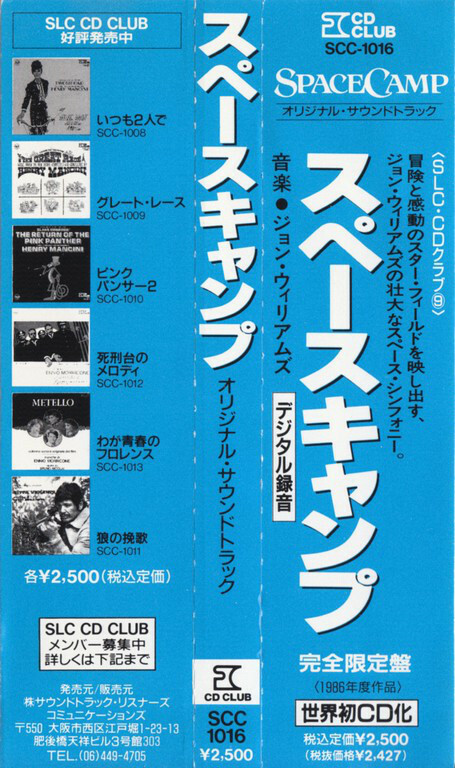 And again like their American counterparts, found their way into a collector's hands and saved. 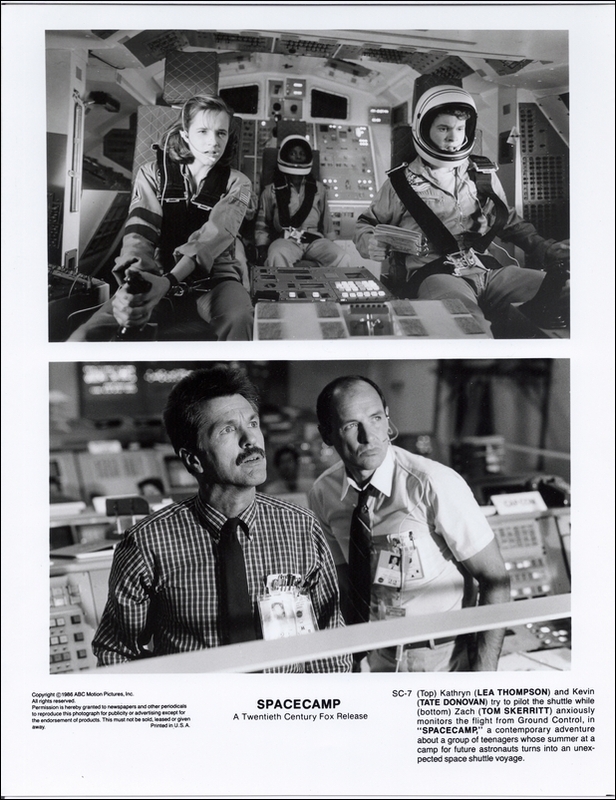 Like the German Lobby Cards, this set, which features actor-in-character shots from the film, conform to a different standard and composition than regular lobby cards do. 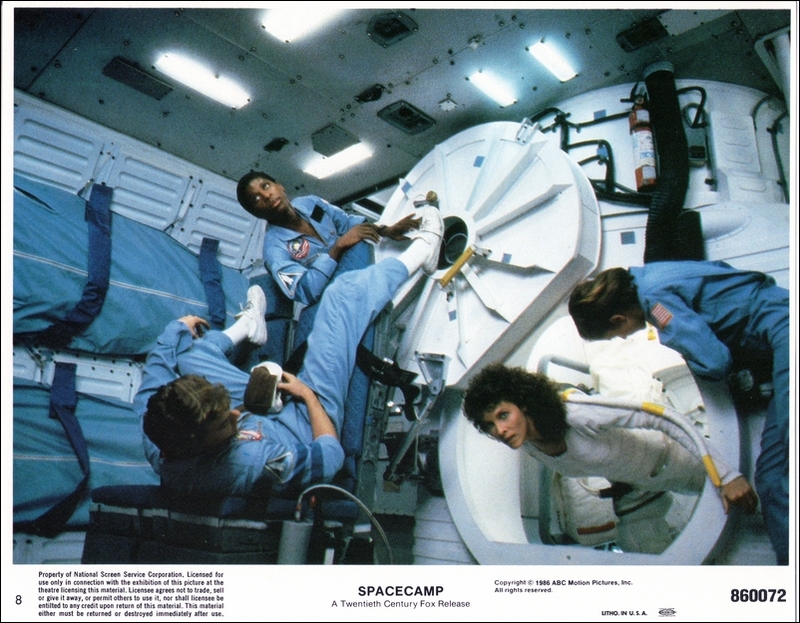 These are poster-like, printed on regular printed paper, semi-gossy for the photographs of course, rather than on card stock. 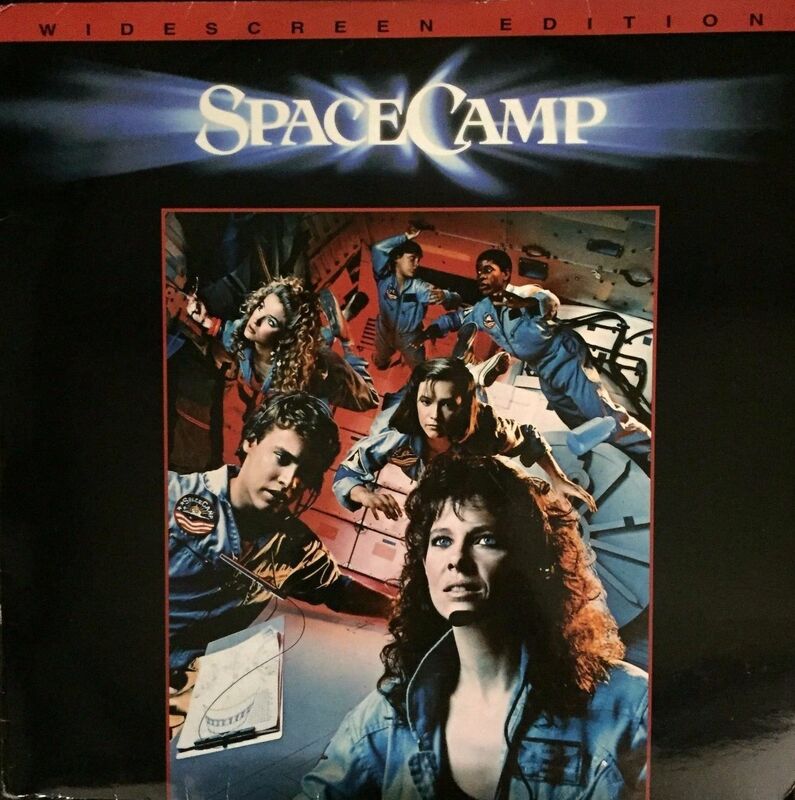 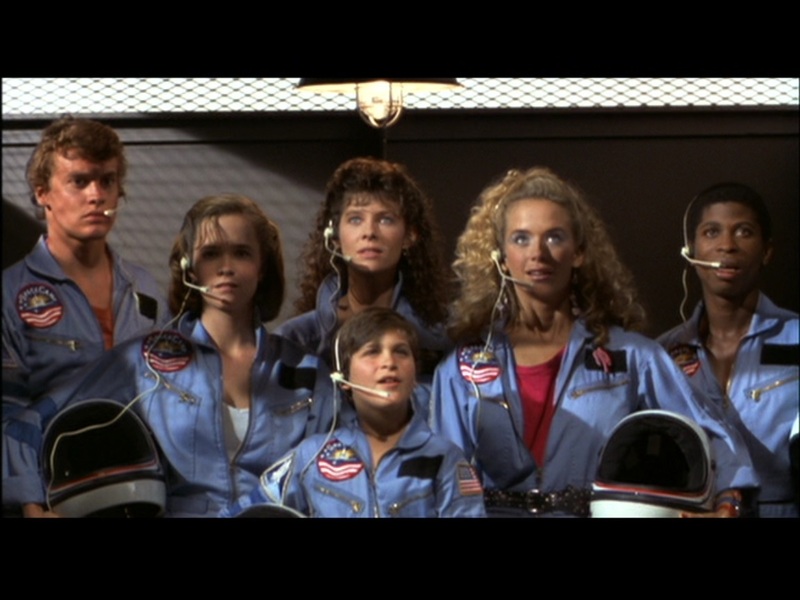 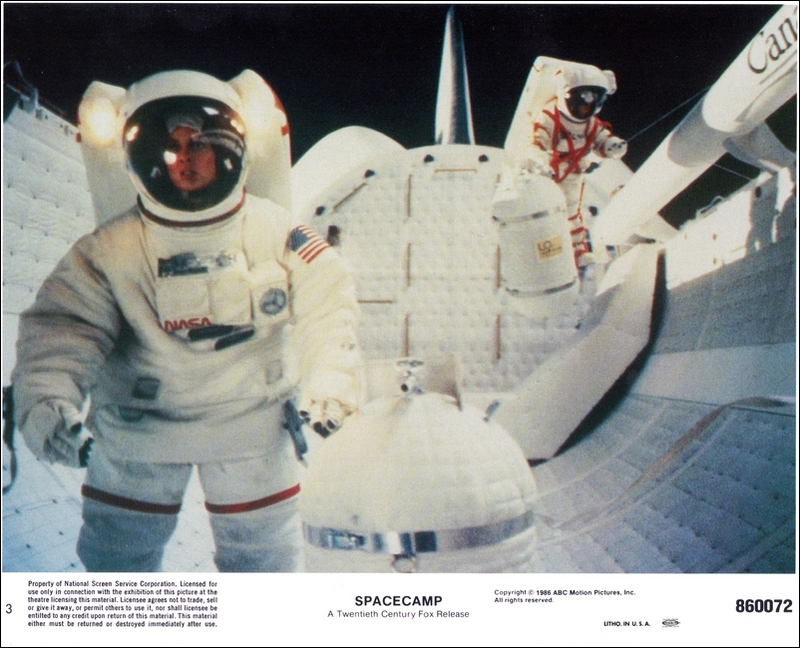 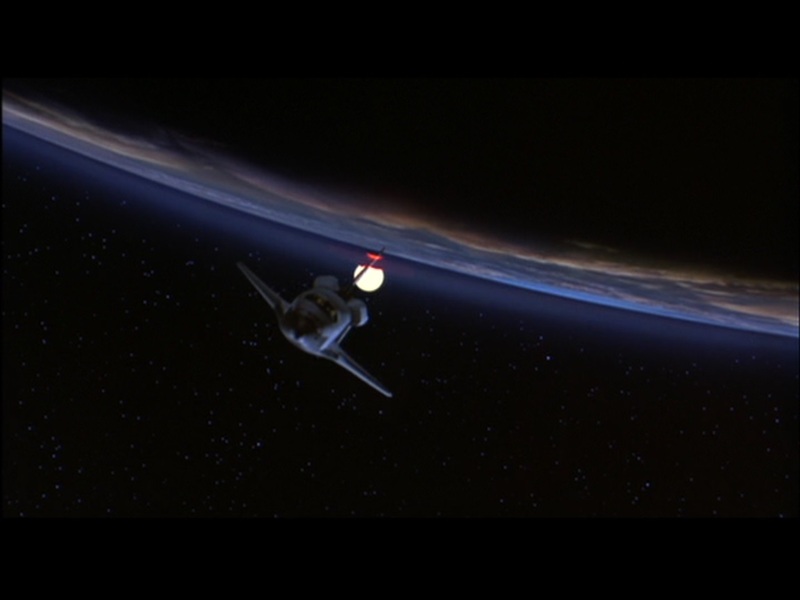 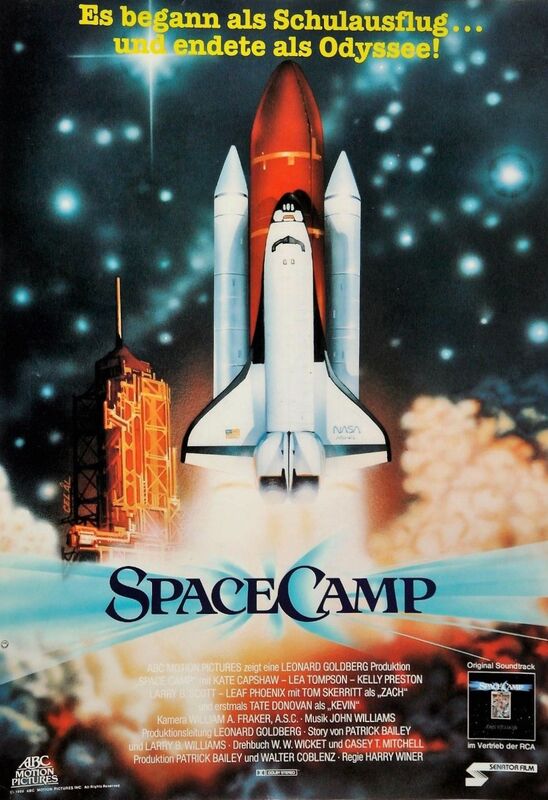 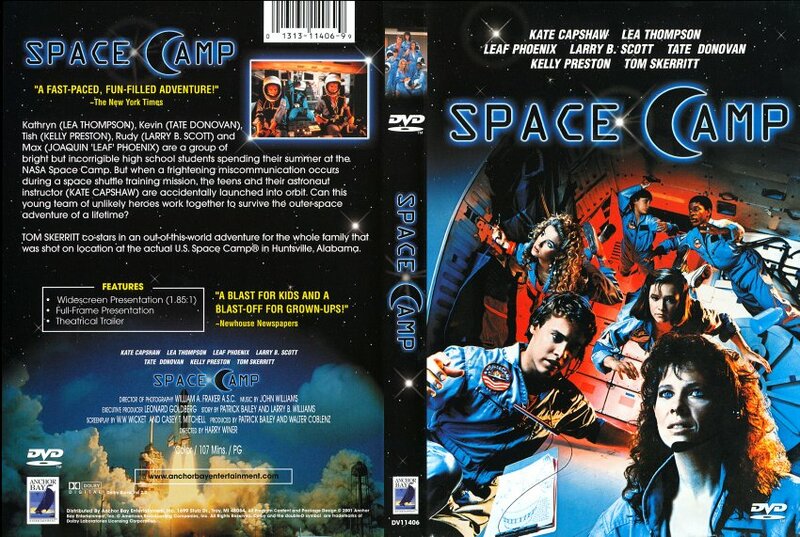 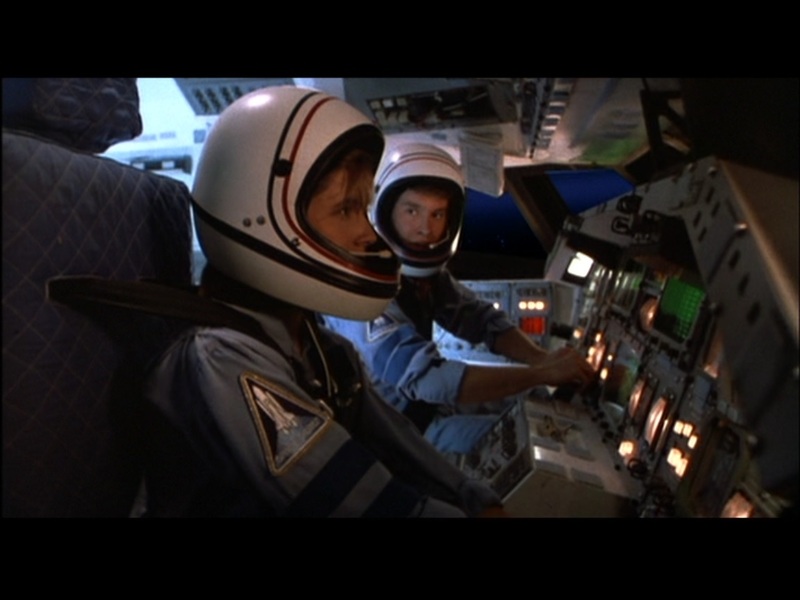 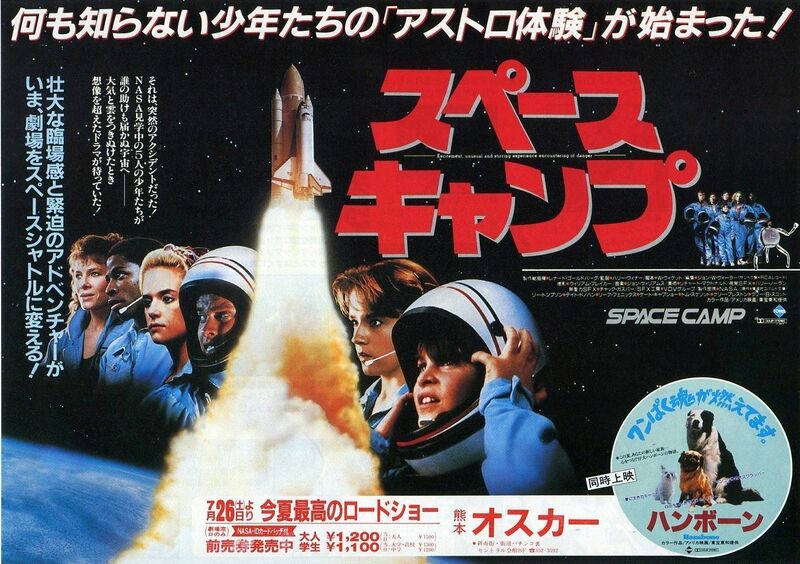 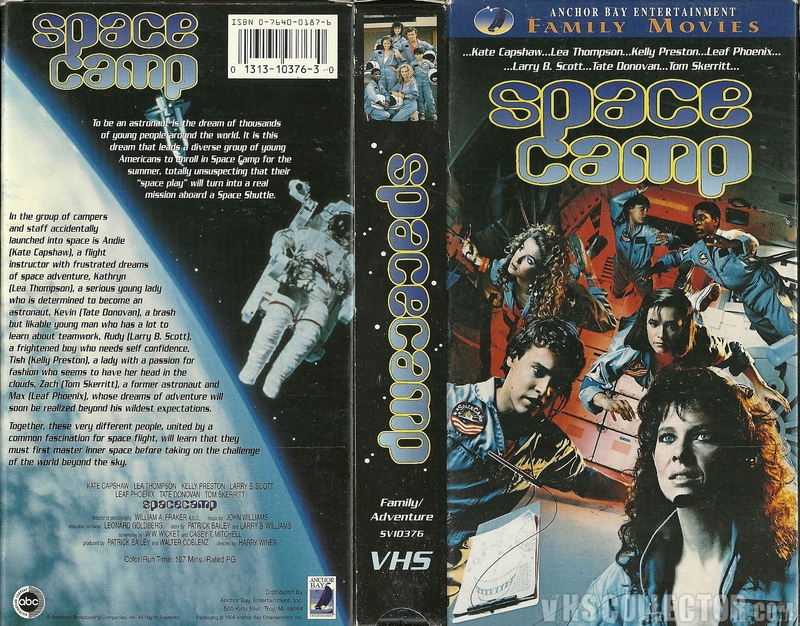 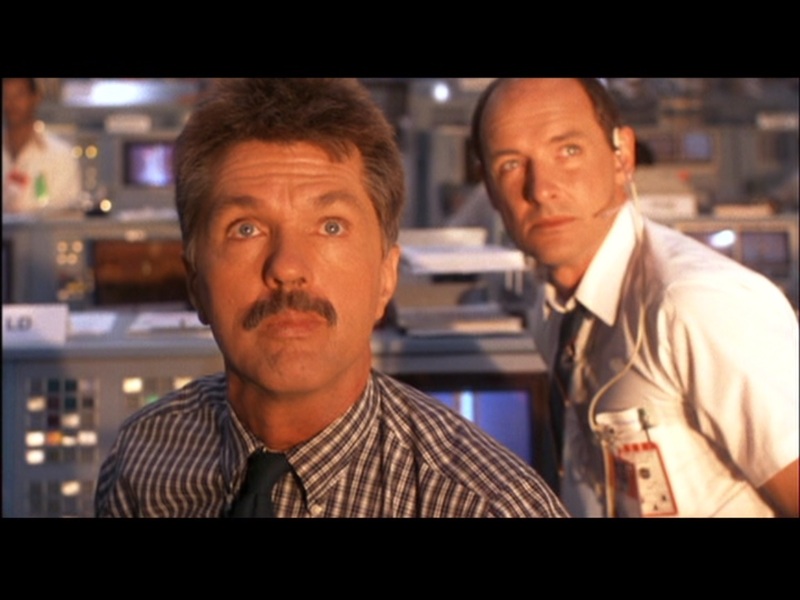 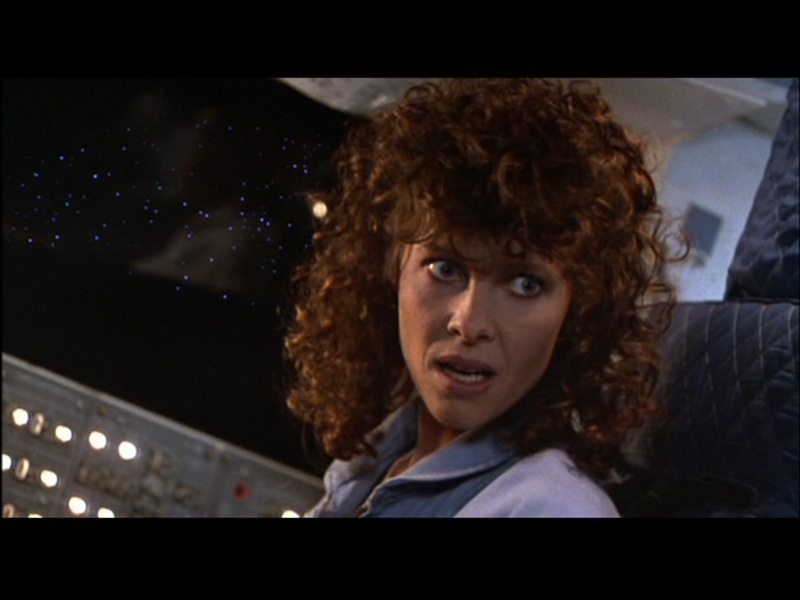 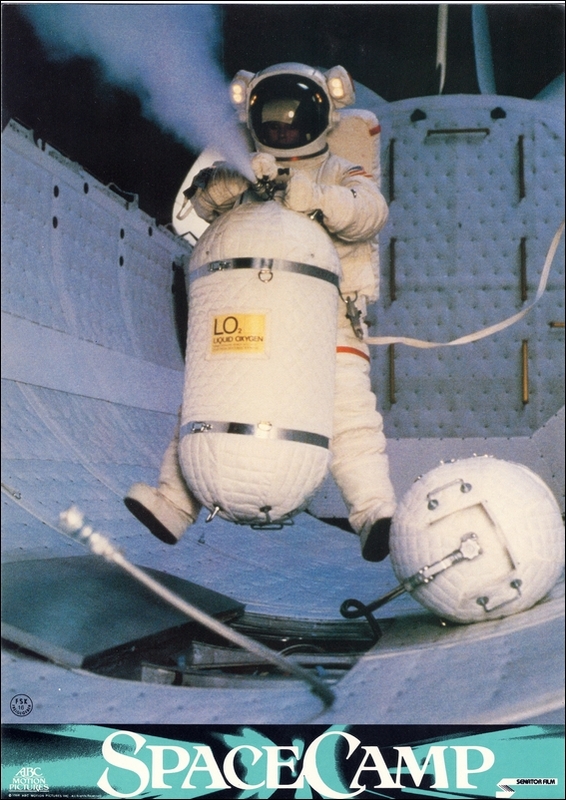 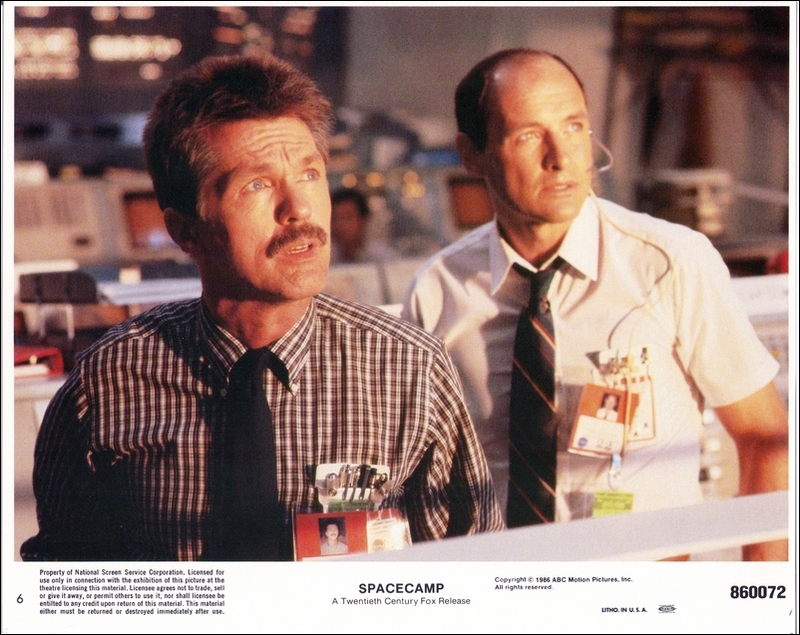 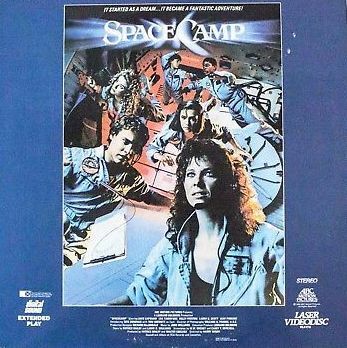 While SpaceCamp was distrubted by 20th Century FOX in the United States, a company called Producers Sales Organization (PSO) handled distribution to certain overseas markets. 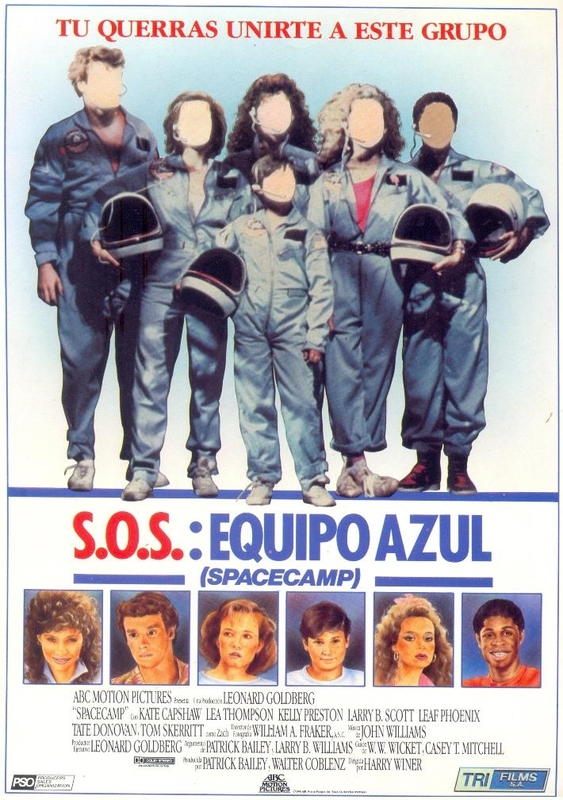 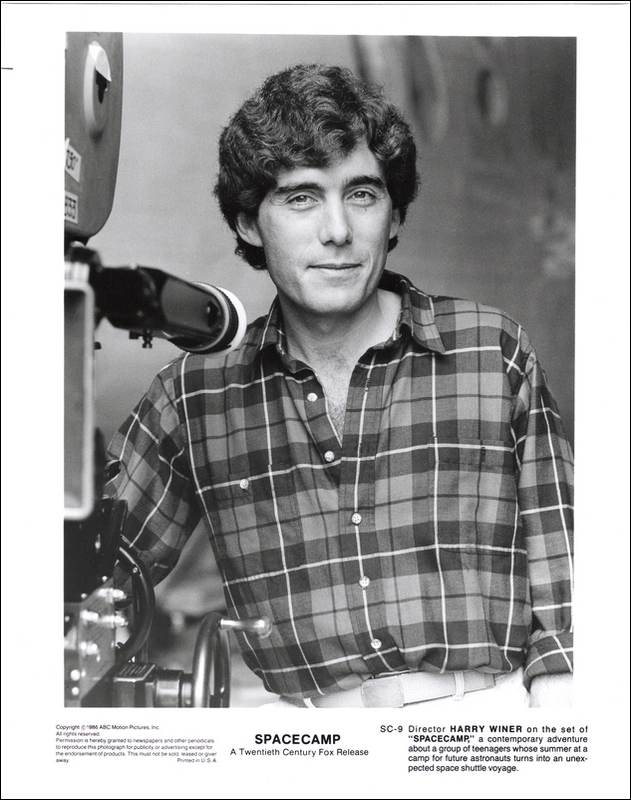 Despite releasing many successful independent films, PSO ran into financial problems and was forced into bankruptcy in 1986, effectively ending the company. 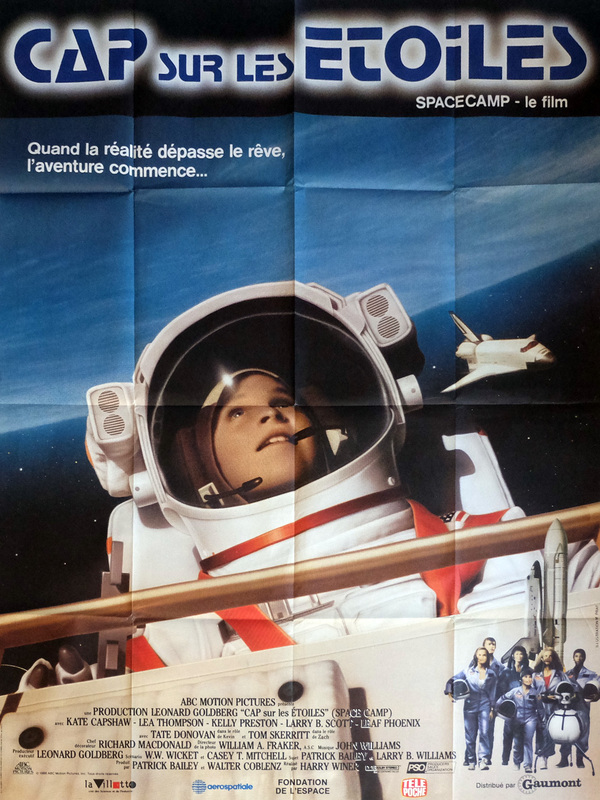 What you see here are a small number of artifacts that have survived (although you'll find more in the Posters category). 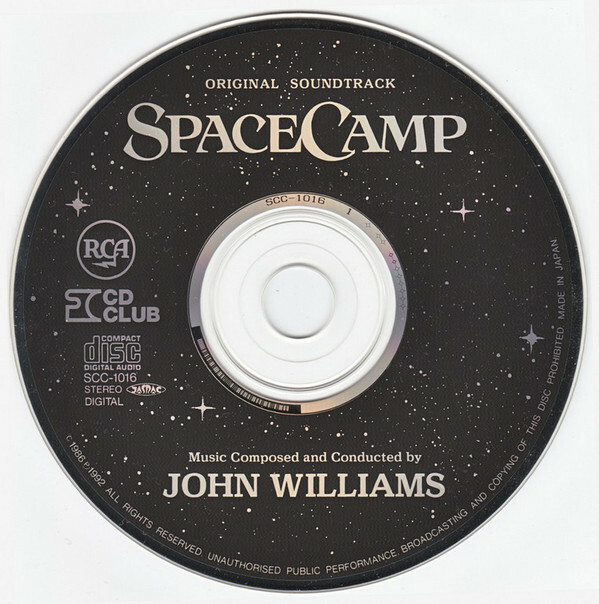 A press kit, often referred to as a media kit in business environments, is a pre-packaged set of promotional materials of a person, company, or organization distributed to members of the media for promotional use. 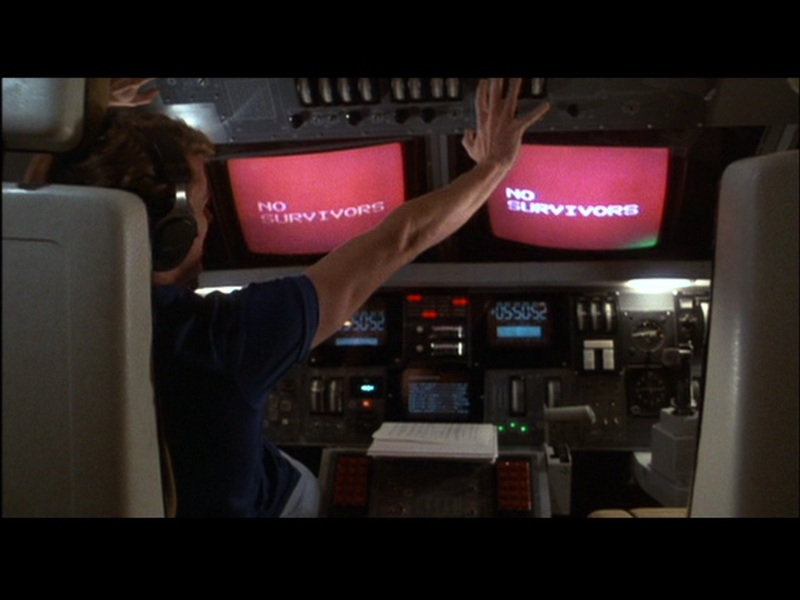 They are often distributed to announce a release or for a news conference. 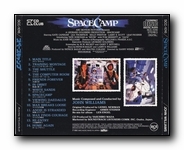 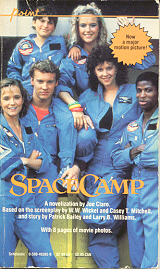 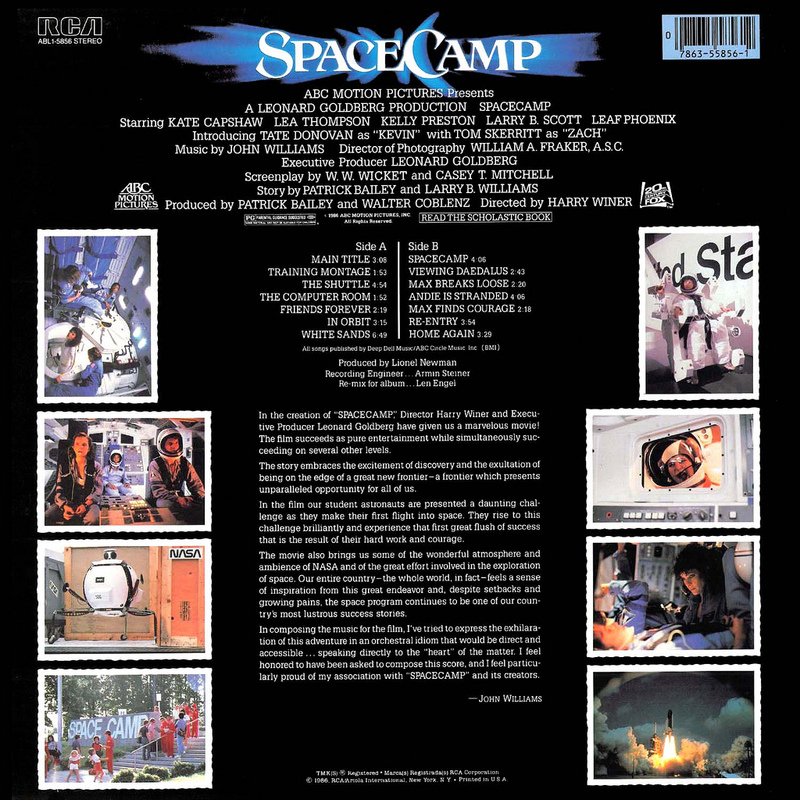 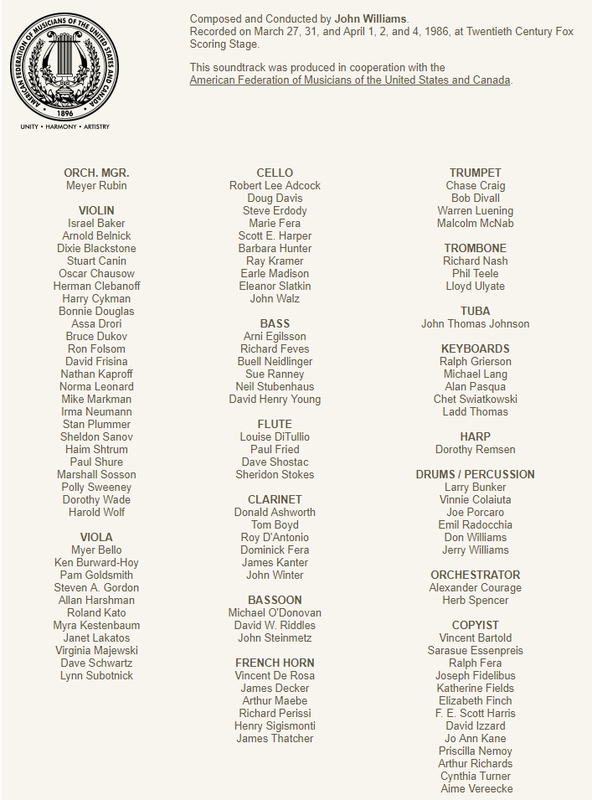 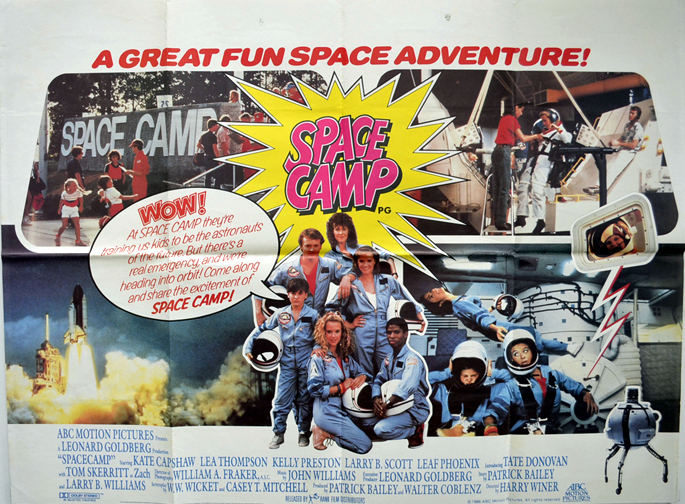 The common components of the SpaceCamp Press Kit include: A two-page "Announcement" sheet, a press-release detailing the film for potential audiences and announcing it is now in theaters (to be used by newspapers as the movie's advertisement); A six-page "Cast Listing" sheet, a full listing of cast and crew for the film, as well as, full source music listing and accreditation; A forty-four page "Production Notes" packet, a backgrounder with historical information on the company and film, a fact-sheet listing specific features and statistics, biographies of key cast members and production crew; And a packet of eight black-and-white, high-gloss/high-resolution photos for newspaper print. 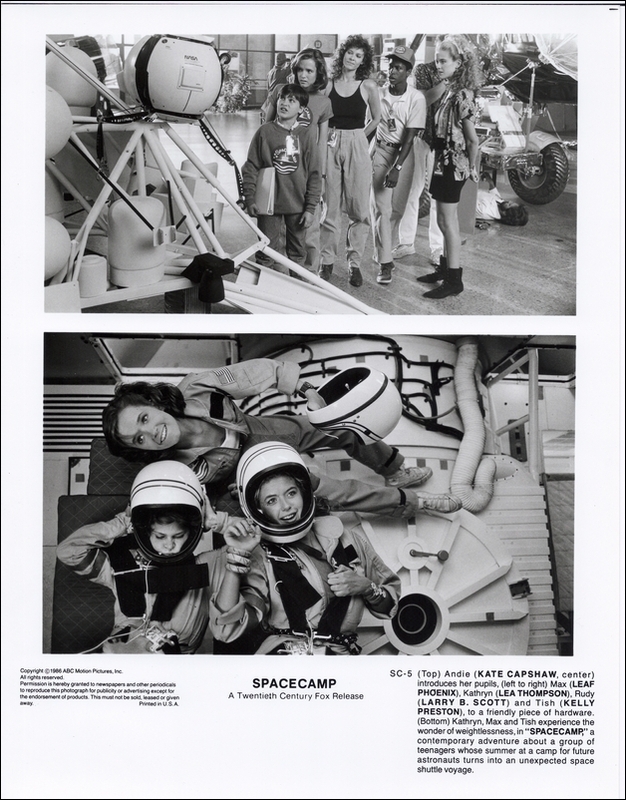 black and white, high-gloss photos for news print. 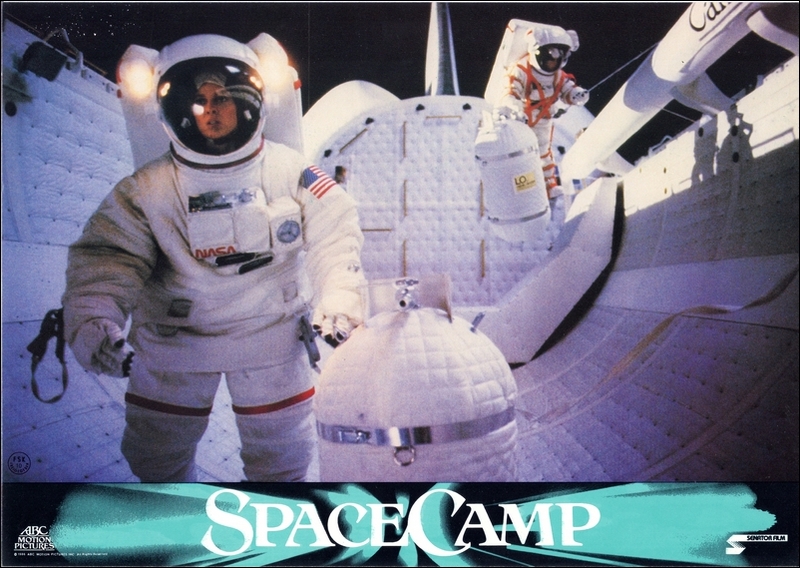 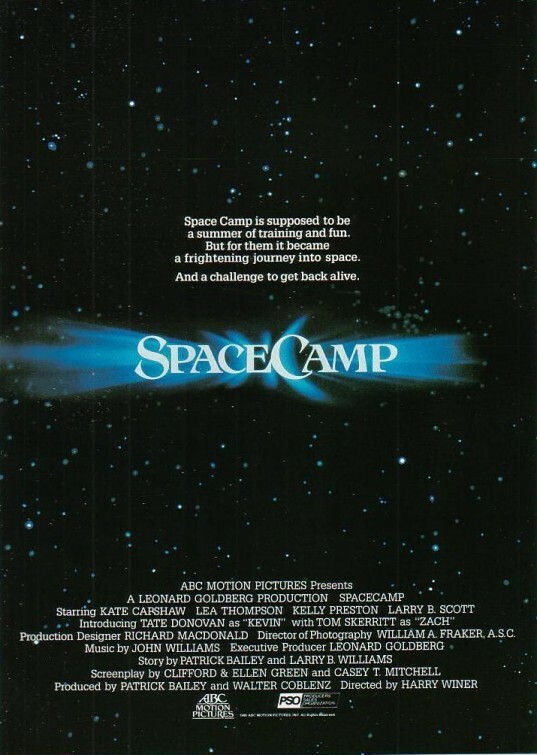 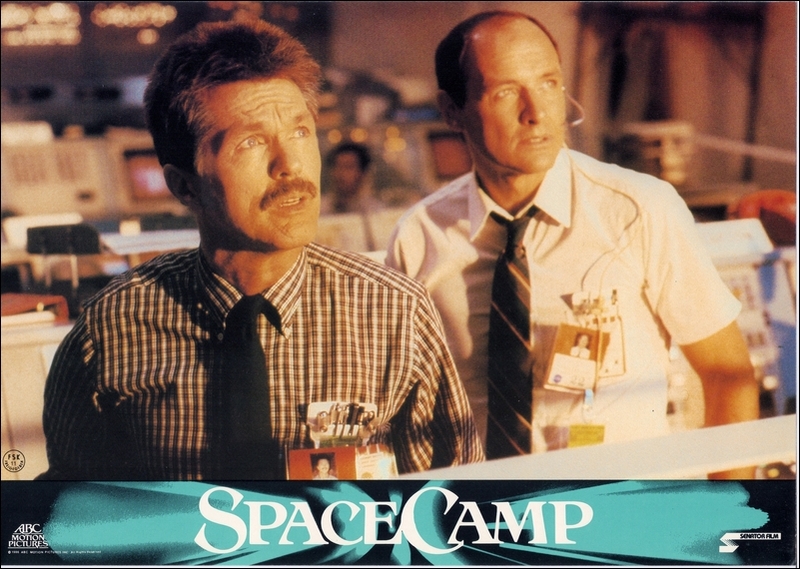 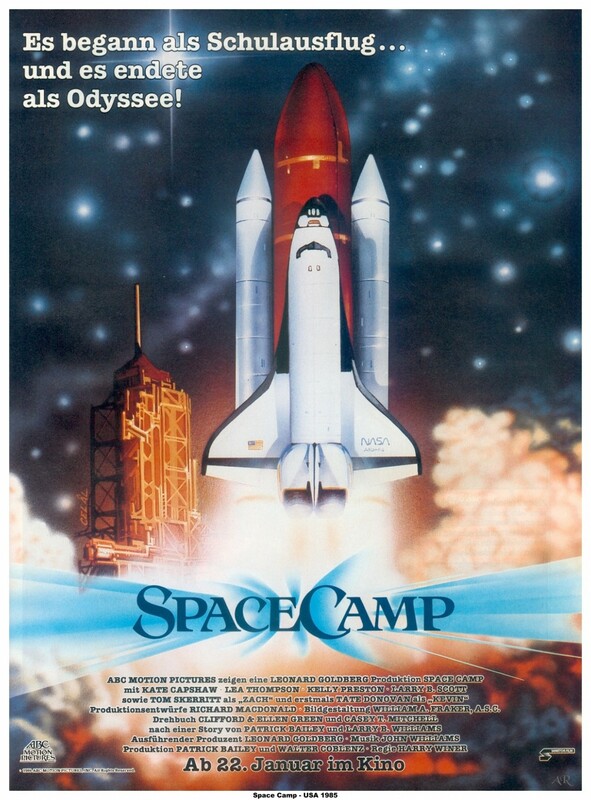 SpaceCamp: The movie was wide-released to theaters (969 screens) in the United States on Friday, June 6, 1986 by Twentieth Century Fox. 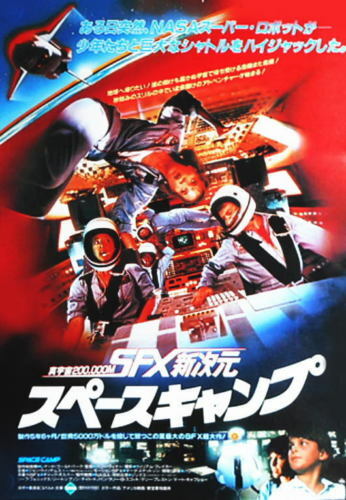 The film was also released in limited international markets to very little success (Japan on 12 July 1986, Australia on 30 October 1986, France on 12 November 1986, and Sweden on 19 Decemebr 1986). 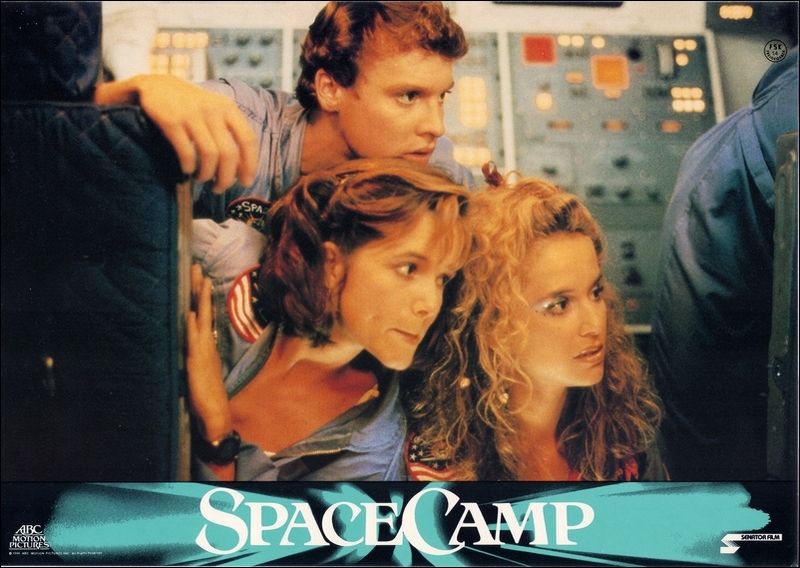 The budget for SpaceCamp: the Movie has not been released; however, the film grossed only $2,918,072 in its opening weekend in the United States, and grossed only $9,697,739 in the US by the end of its short run. 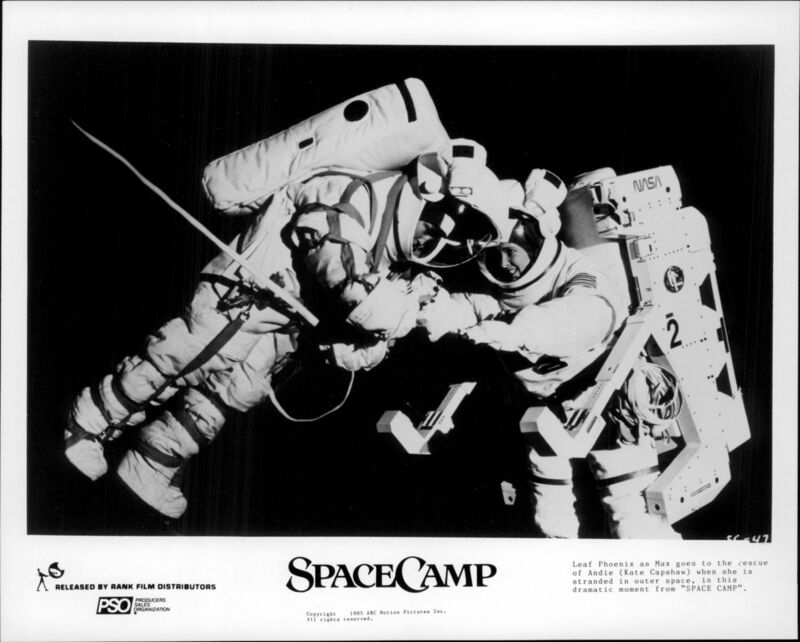 The film has become something of a cult classic due to its lack of success and as such I've been able to collect a few posters from the film. 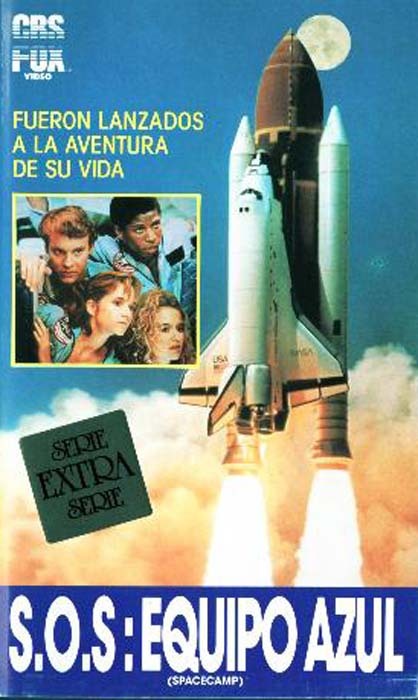 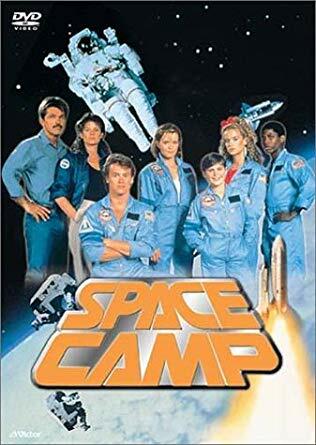 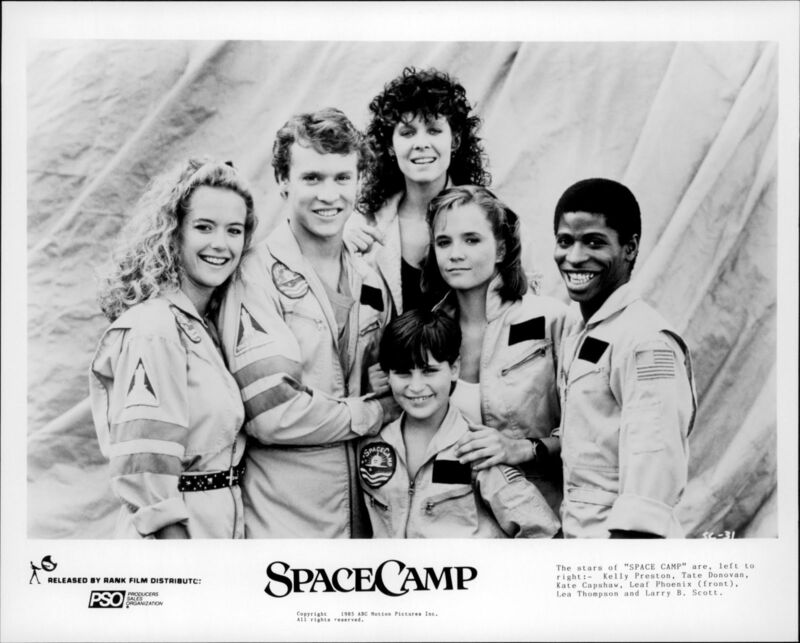 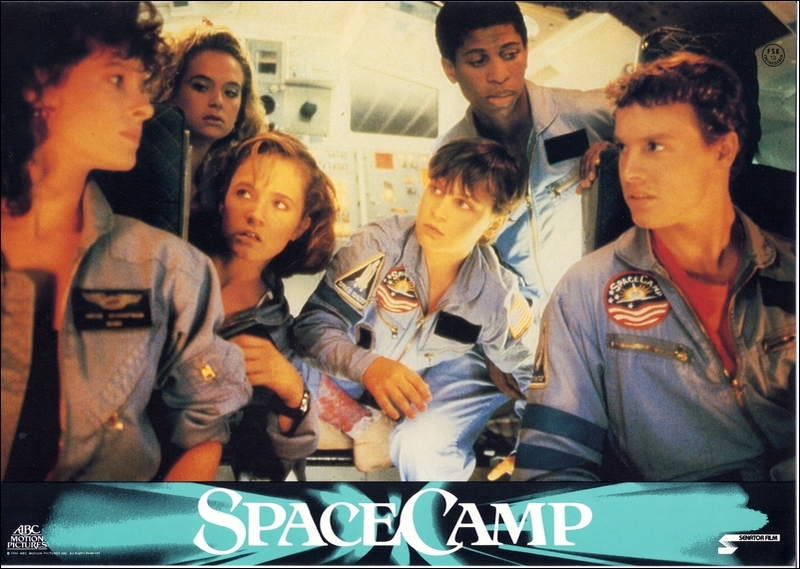 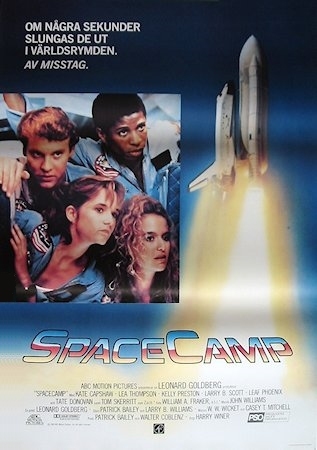 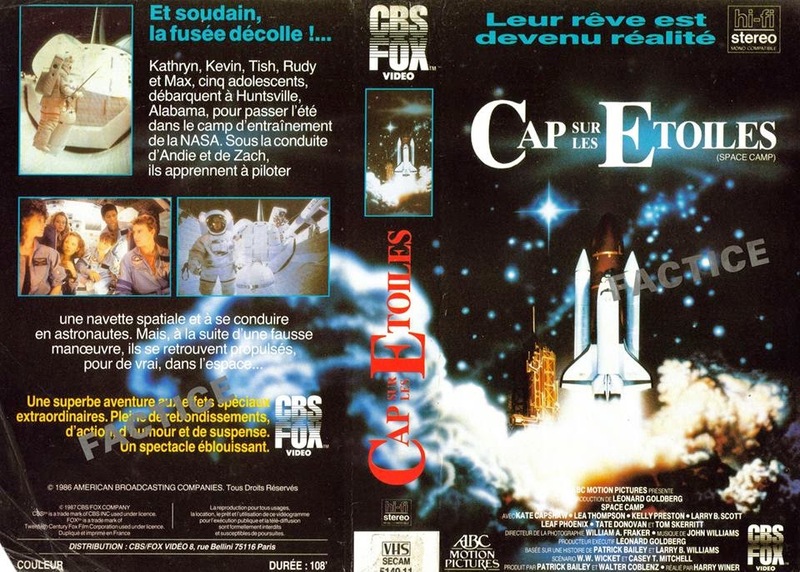 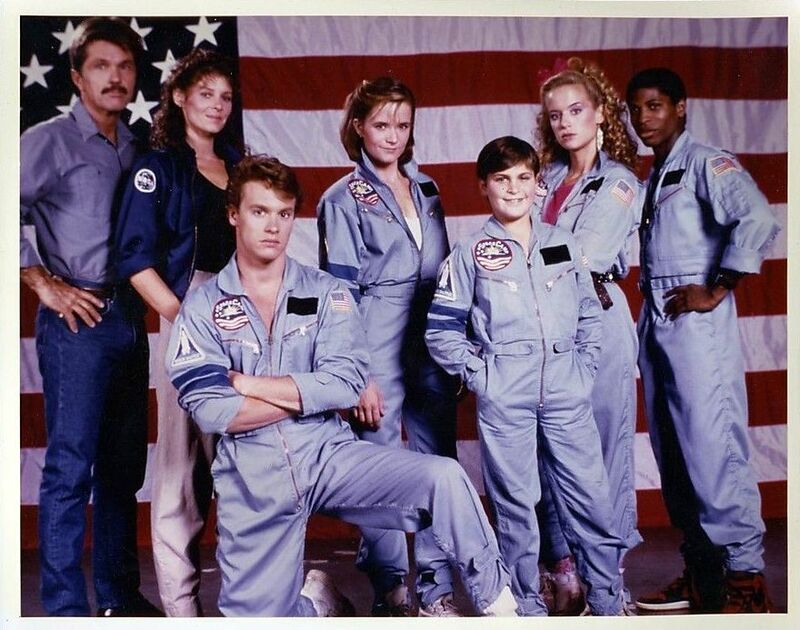 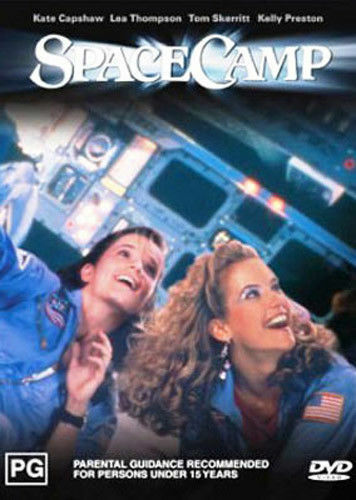 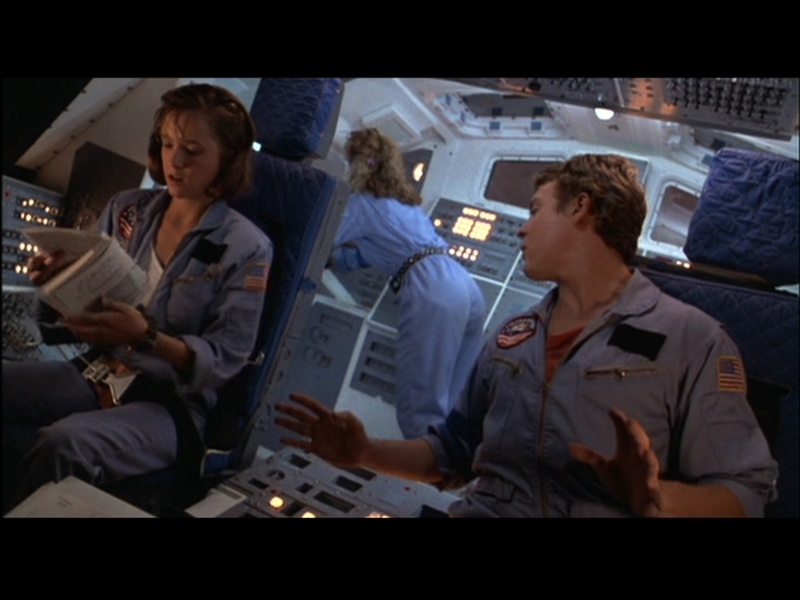 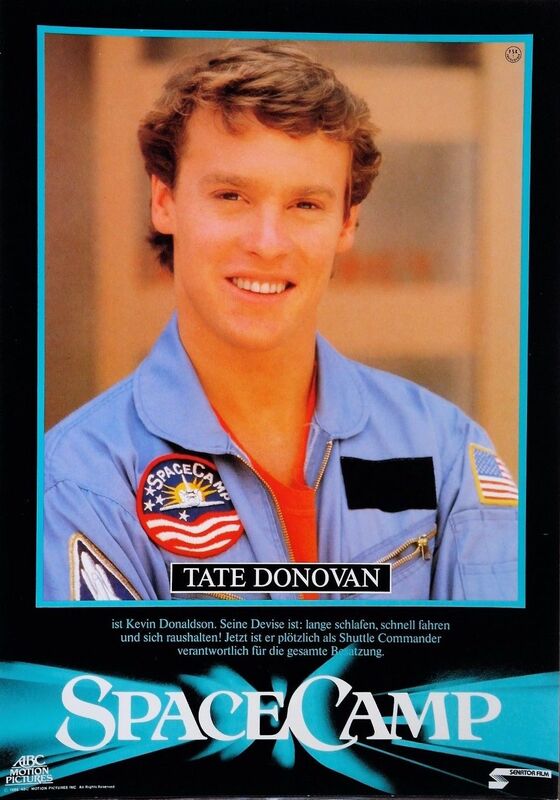 Kathryn (Lea Thompson), Kevin (Tate Donovan), Tish (Kelly Preston), Rudy (Larry B. Scott) and Max (Joaquin 'Leaf' Phoenix) are a group of bright but incorrigible high school students spending their summer at the NASA SpaceCamp. 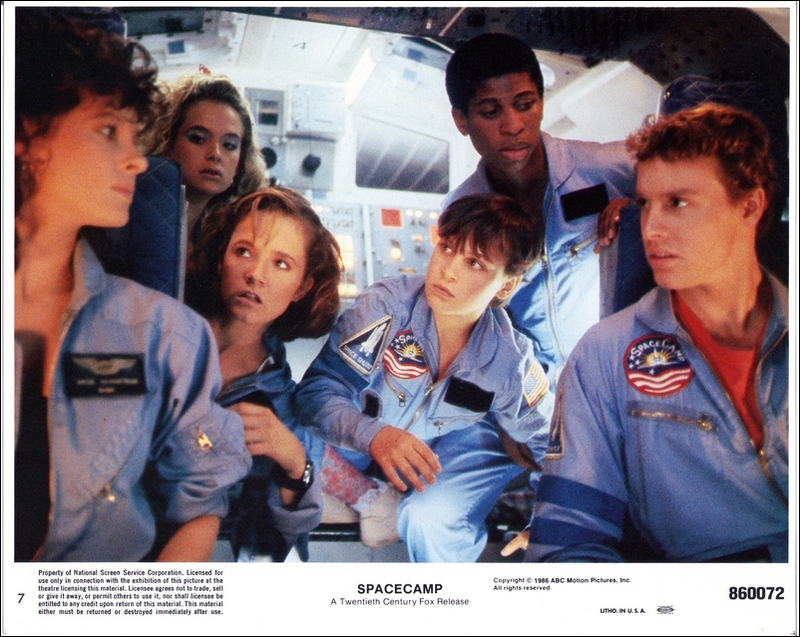 A few days into their instruction, the teens and their astronaut instructor (Kate Capshaw) get the incredible opportunity to go aboard the Space Shuttle Atlantis during a 20-minute engine test. 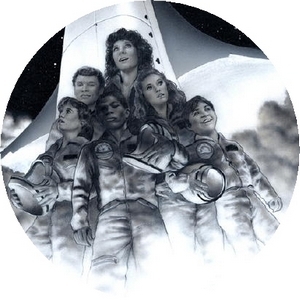 While the youngsters bask in the thrill of being within the Atlantis, a frightening miscommunication occurs, accidentally launching the group into orbit. 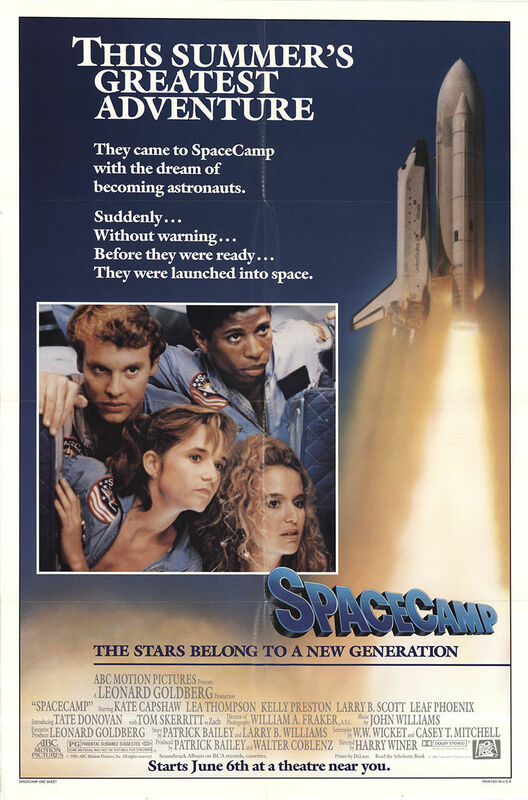 The fledgling astronauts suddenly find themselves speeding toward the weightless world of outer space in a space- craft that is not flight ready! 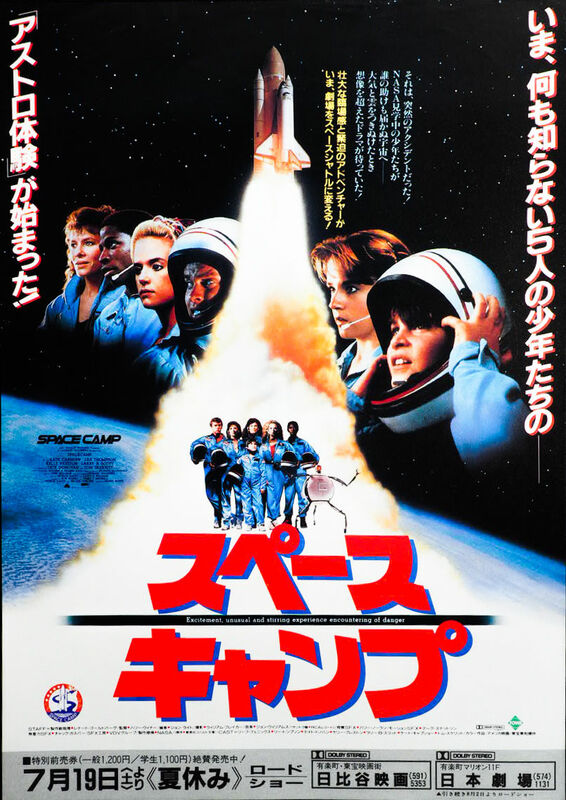 Can this young team of unlikely heroes work together to survive the outer-space adventure of a lifetime? 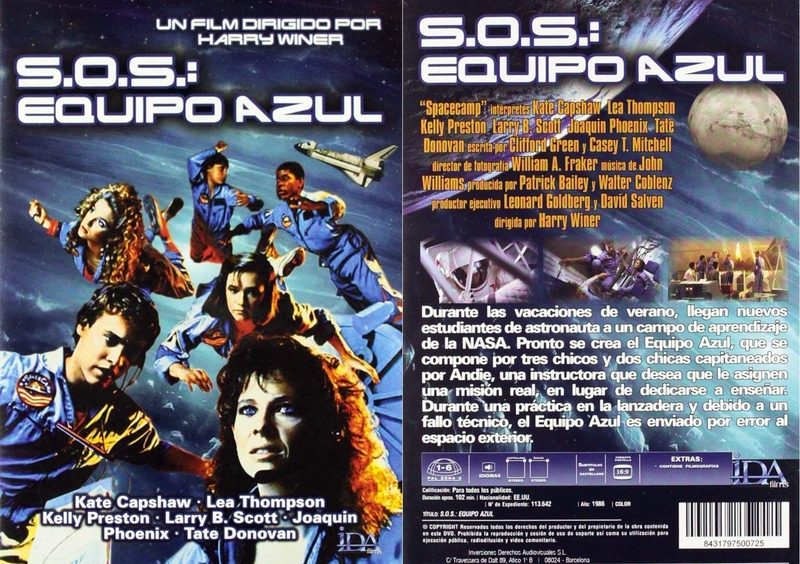 The group will learn the meaning of courage, trust and teamwork as never before when they unite to survive this incredible adventure of beauty, mystery and danger. 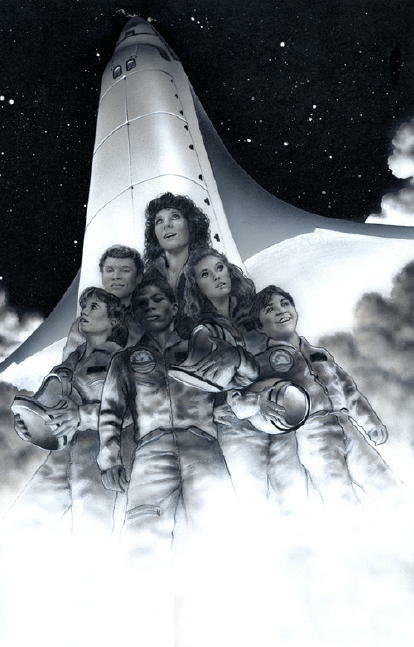 The movie tie-in is a rather thin book of just under 140 pages from Prologue to Epilogue, containing twenty-eight (28) numbered chapters (30 total including the beforementioned Prologue and Epilogue), and includes eight (8) pages of black & white photos from various scenes. 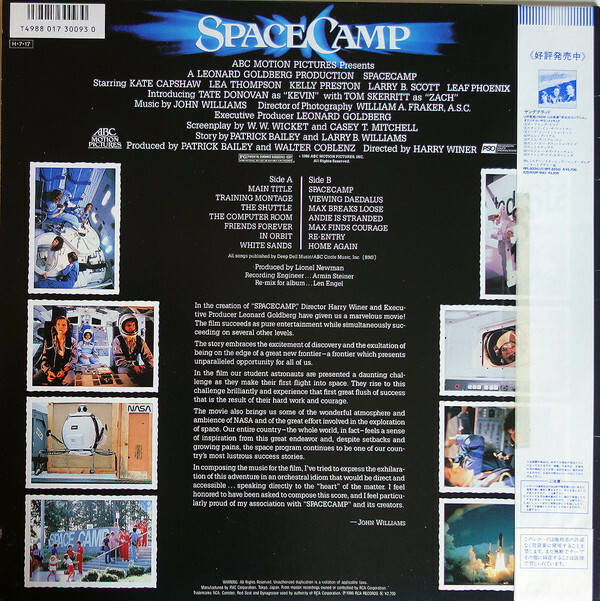 Back Cover: SpaceCamp! 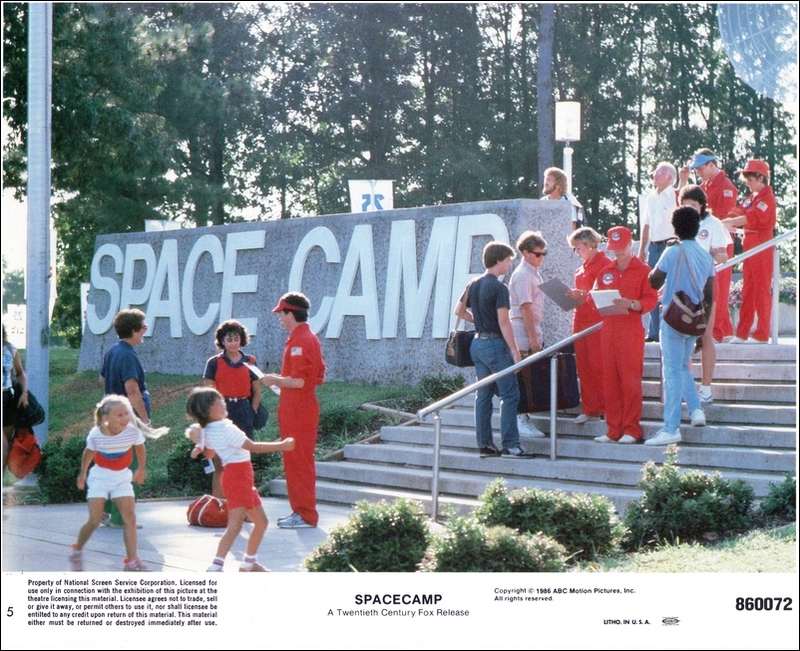 Every summer, people flock there from across the country for official astronaut training on real NASA equipment...and to fulfill a dream. 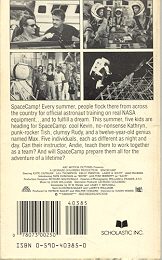 This summer, five kids are heading for SpaceCamp: cool Kevin, no-nonsense Kathryn, punk-rocker Tish, clumsy Rudy, and twelve-year-old genius named Max. 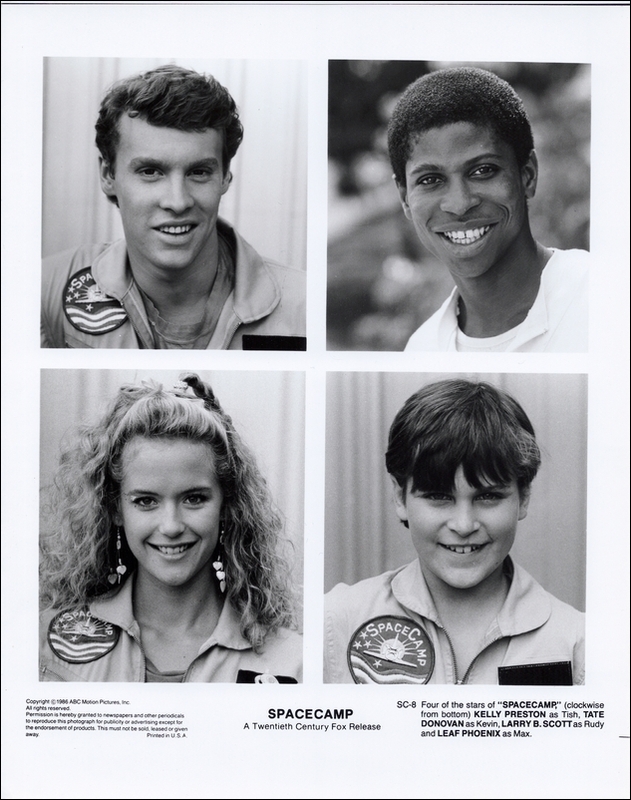 Five individuals, each as different as night and day. 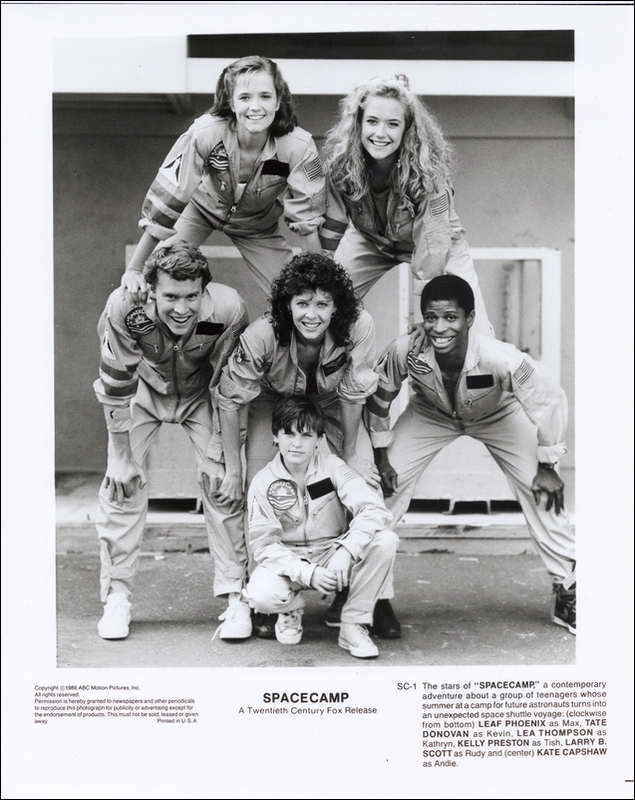 Can their instructor, Andie, teach them to work together as a team? 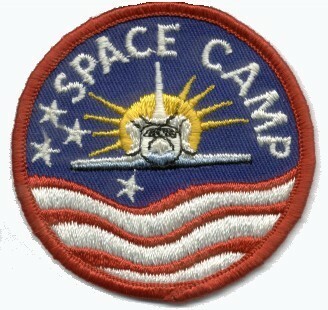 And will SpaceCamp prepare them all for the adventure of a lifetime? 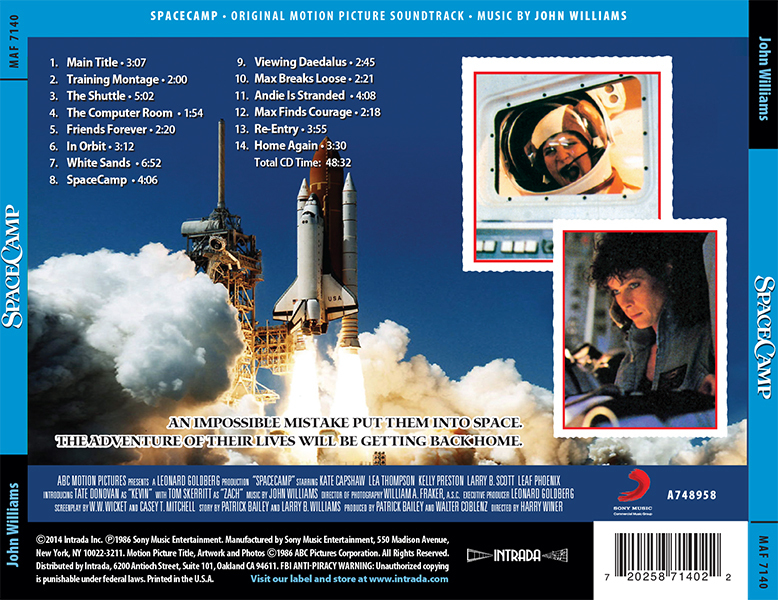 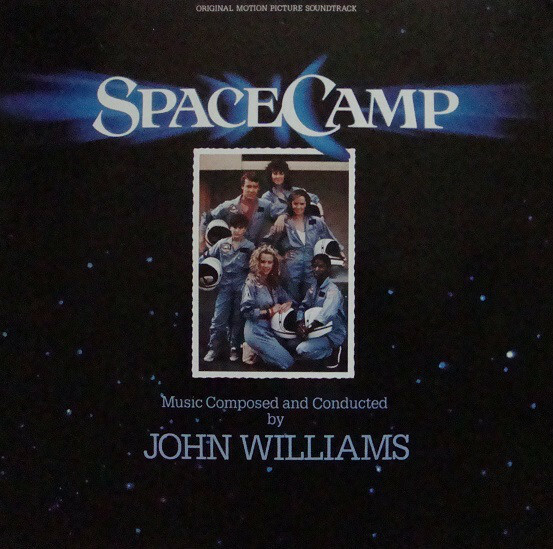 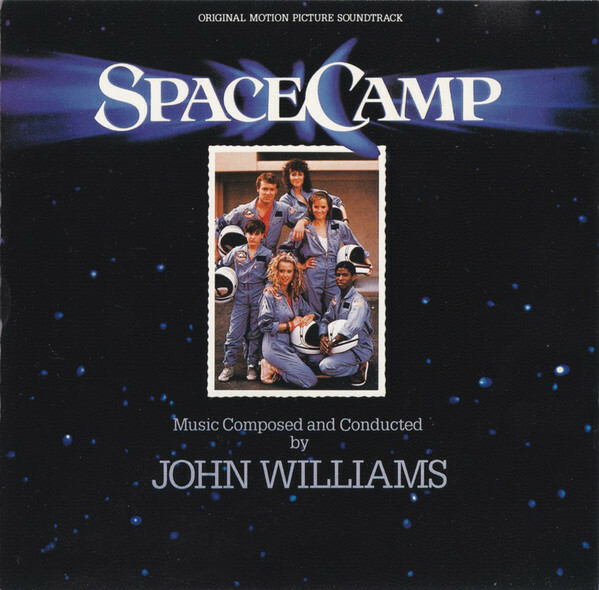 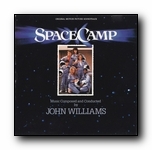 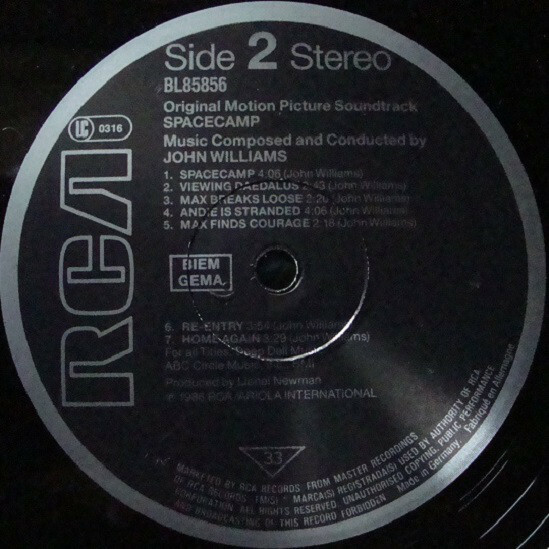 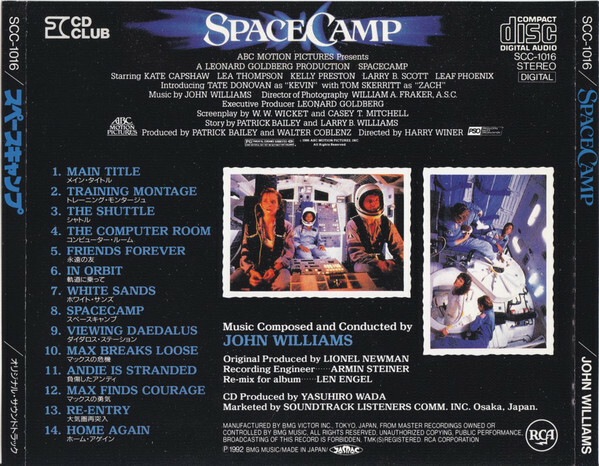 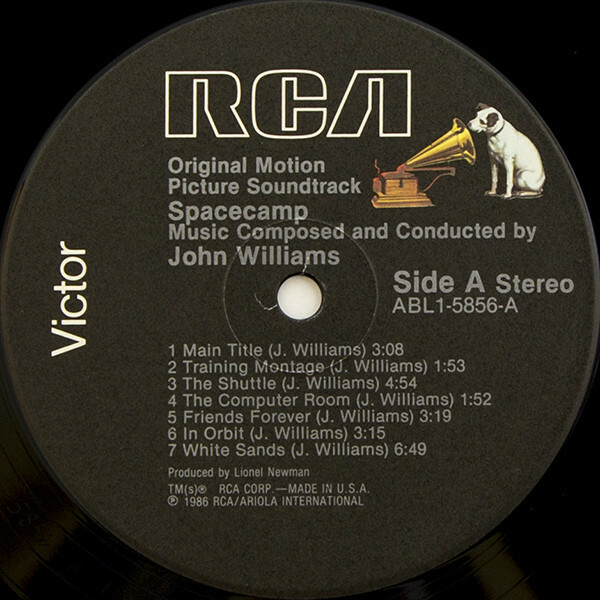 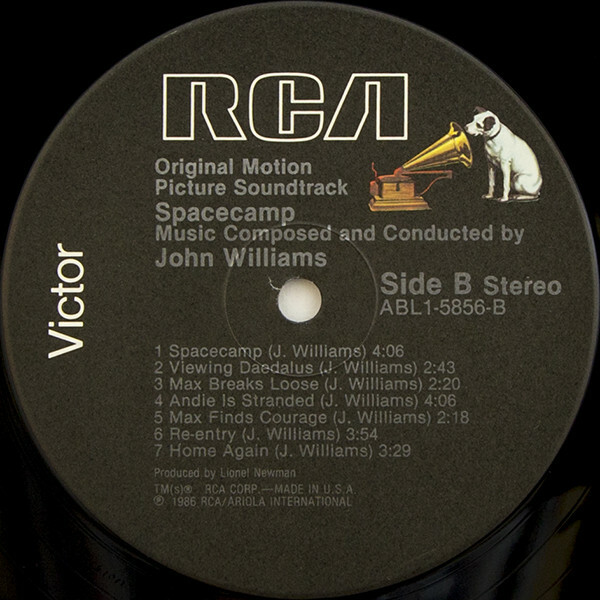 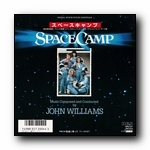 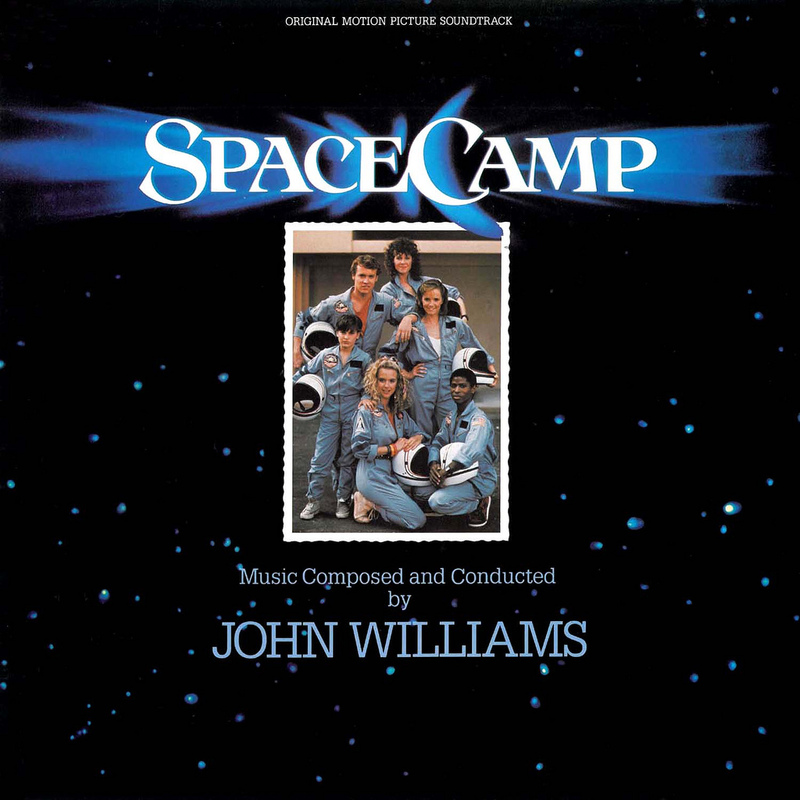 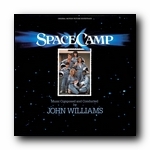 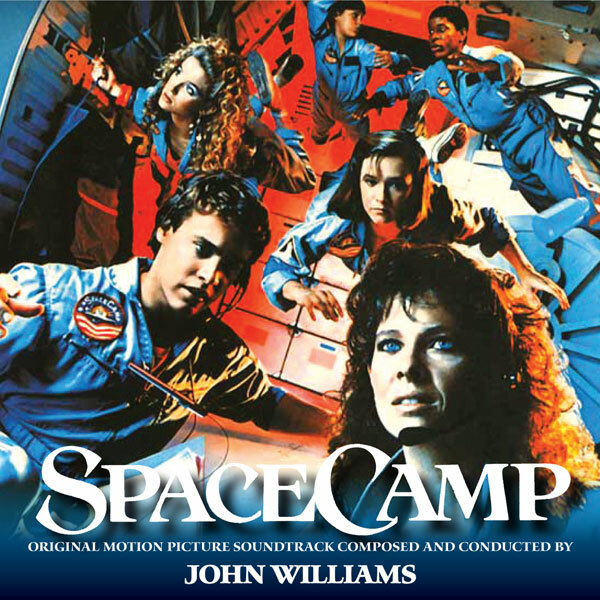 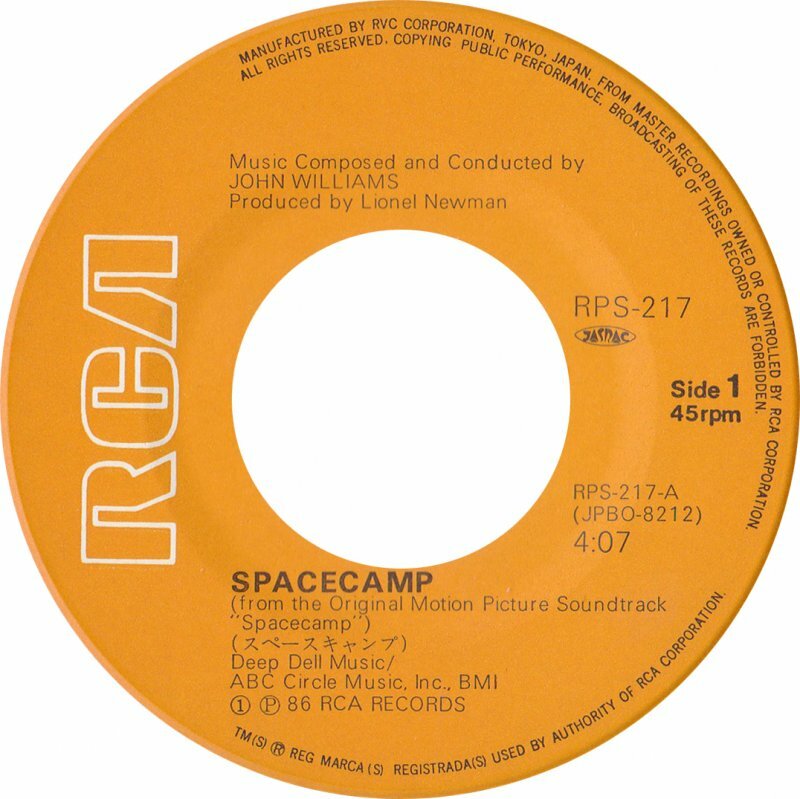 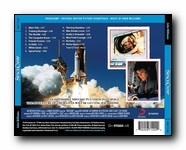 Recorded on March 27, 31, and April 1, 2, and 4, 1986, at Twentieth Century Fox Scoring Stage, the SpaceCamp soundtrack features the score of John Williams (Jaws, Star Wars, Jurassic Park, Harry Potter) packaged in 14 tracks with a runtime of approximately 48 minutes. 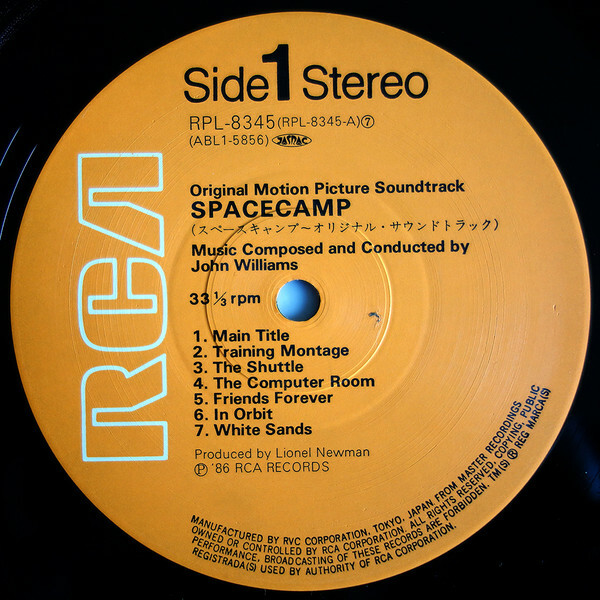 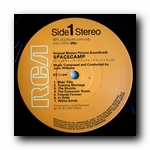 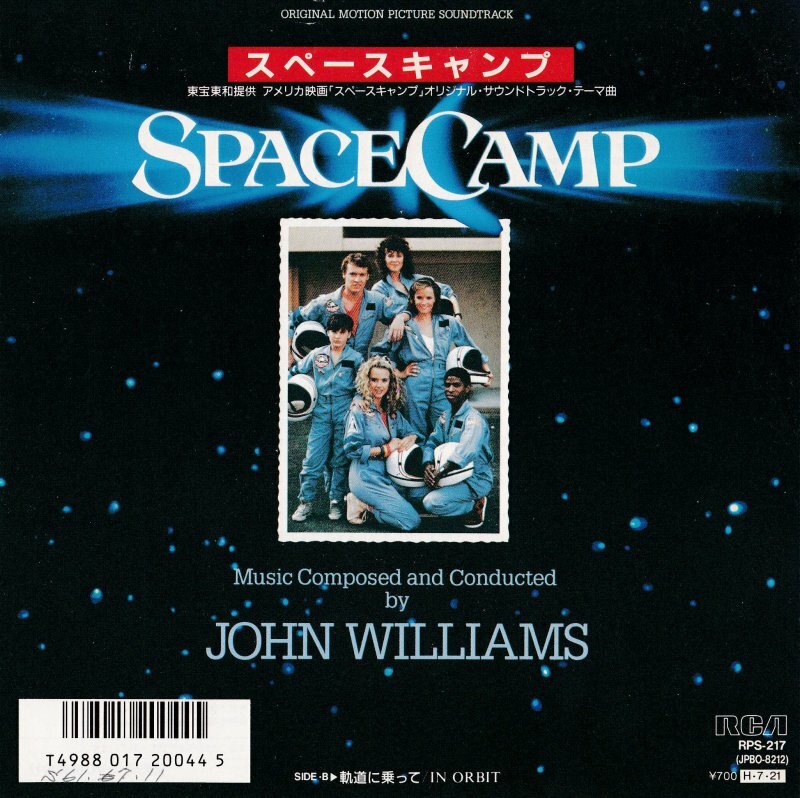 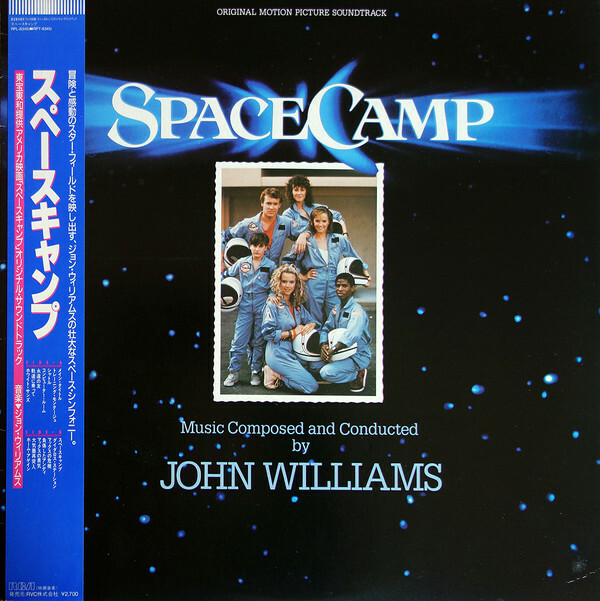 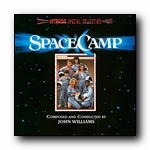 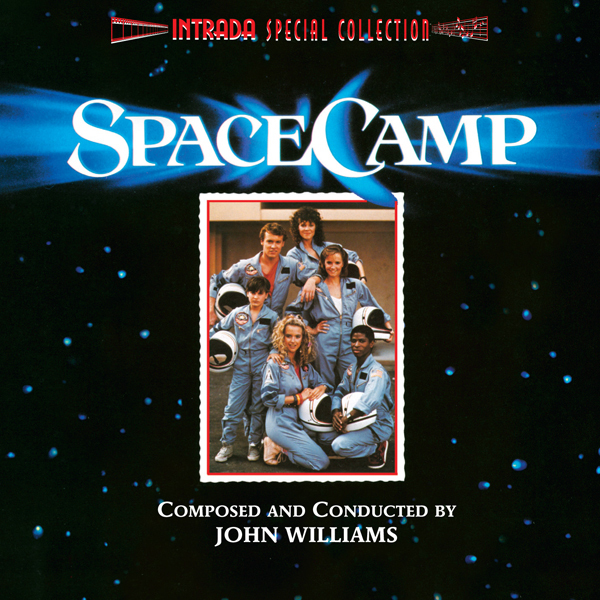 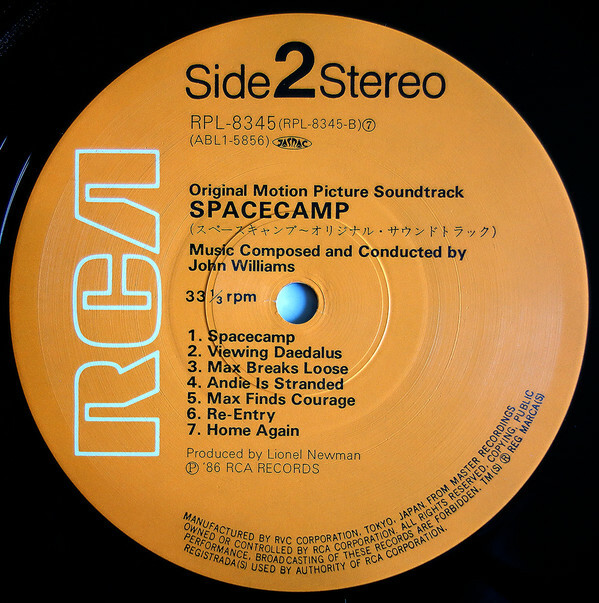 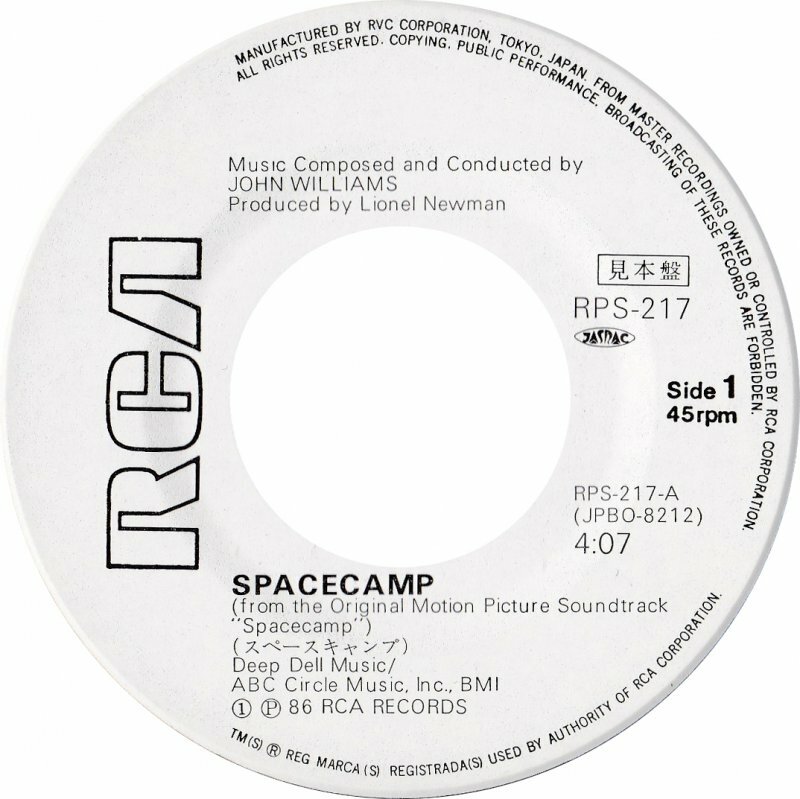 The SpaceCamp soundtrack was originally released commercially in July 1986, and you'd have found it on 33 RPM 12" vinyl in the United States (RCA-ABL1-5856; UPC: 0-7863-55856-1), Japan (RCA-RPL-8345; UPC: T4988017300930), and Germany (RCA–BL8-5856, UPC: 0-035628-585615). 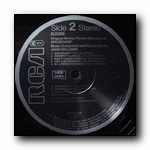 You would also have found a 45 RPM single in Japan as well (Jul.21.1986; RCA-RPS-217; UPC: T4988-017-2044-5). 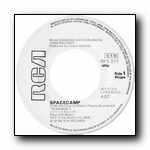 This 7" record contains "SpaceCamp" and "In Orbit" tracks only. 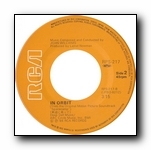 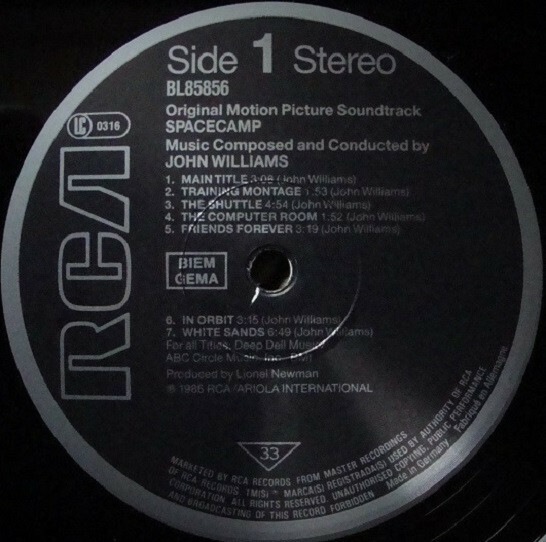 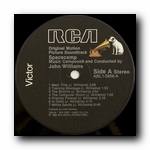 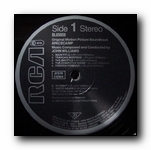 In 2010, Intrada Records pressed an in-stereo direct CD from the RCA album masters now vaulted by Sony, in a 3,000 copy limited release (Special Collection Volume ISC 140; UPC: 7-2025-88958-2-0). 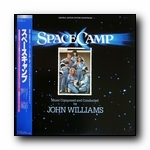 Released on August 17th, it quickly sold out (within the day in fact). 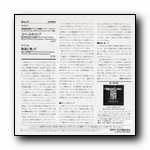 On December 2, 2014, Intrada re-released the CD (as MAF-7140; UPC: 7-2025-87140-2-2) and put the album back in print for good. 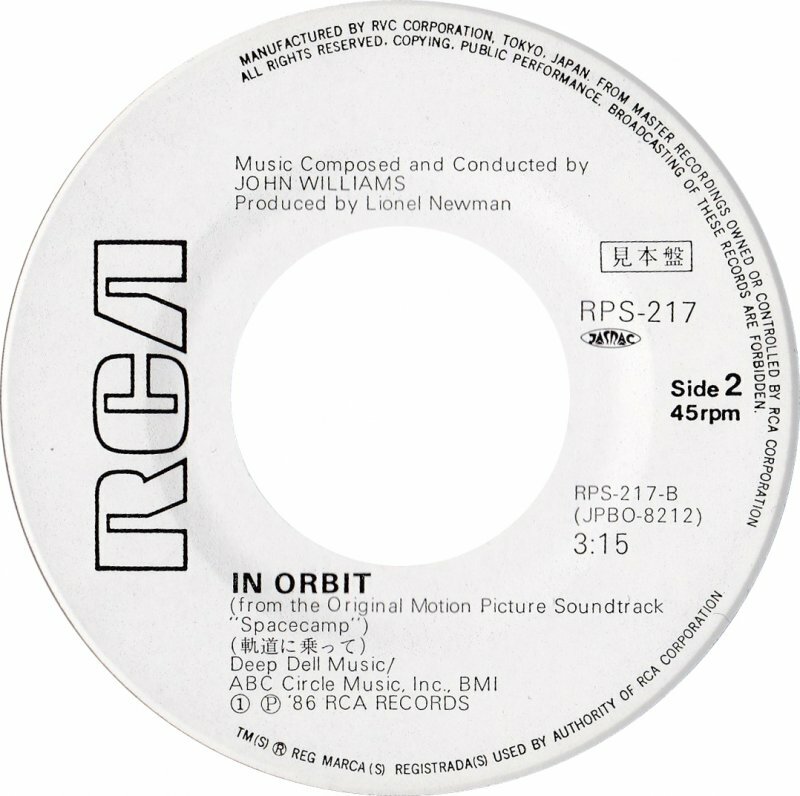 Although this new release sports new cover art (the previous Intrada release used the original album art), the musical contents are the same. 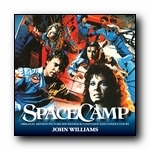 See these and all the other releases here. 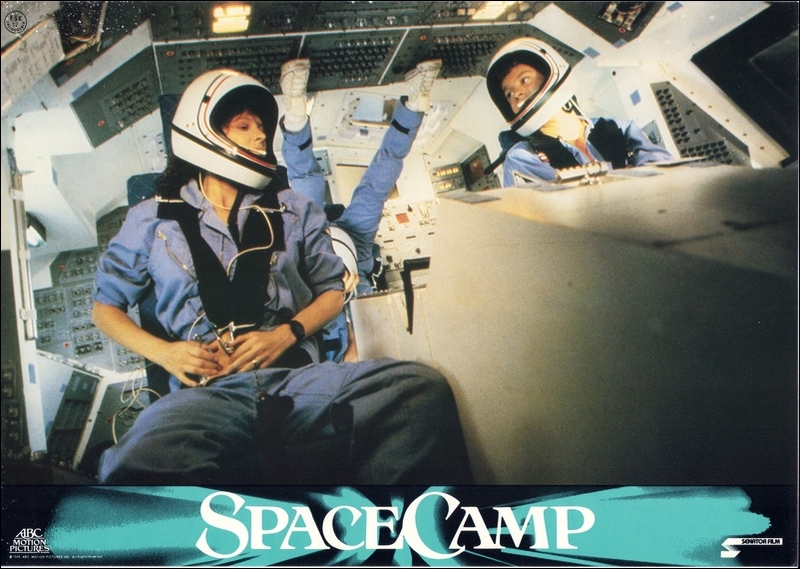 They turned up for camp and ended up in Space! 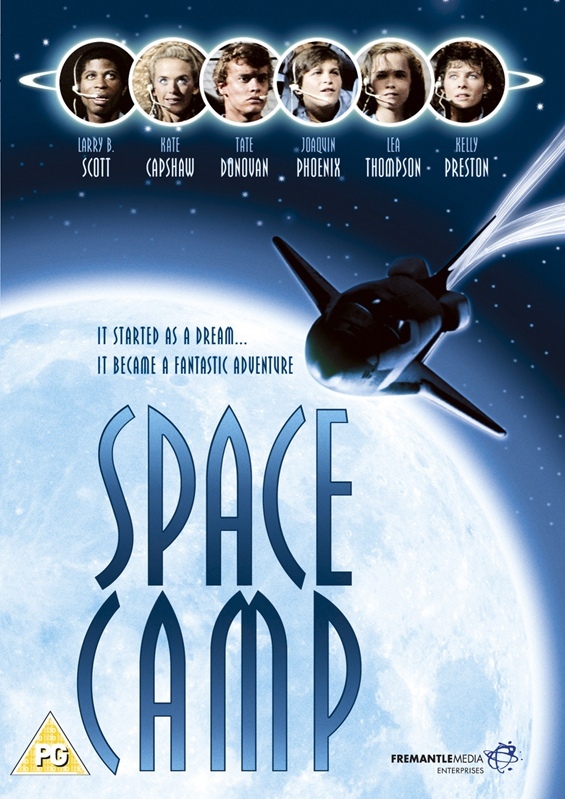 Zero gravity meets zero fear in this cosmic comedy-adventure about a summer camp where regular kids check in... and real astronauts check out! 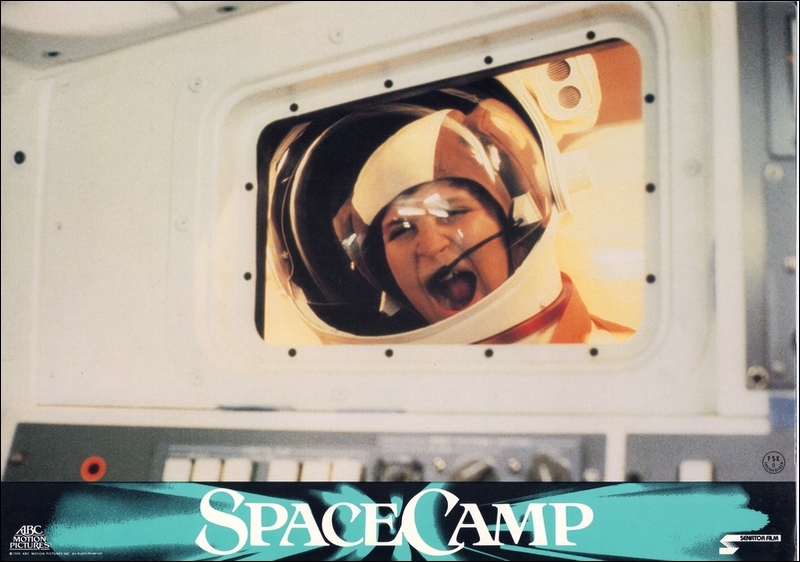 SpaceCamp is a wild and wonderful thrill-ride packed with "special effects...spectacular moments" (Film Journal) and a "gripping climax" (Time Out Film Guide) that's out of this world! 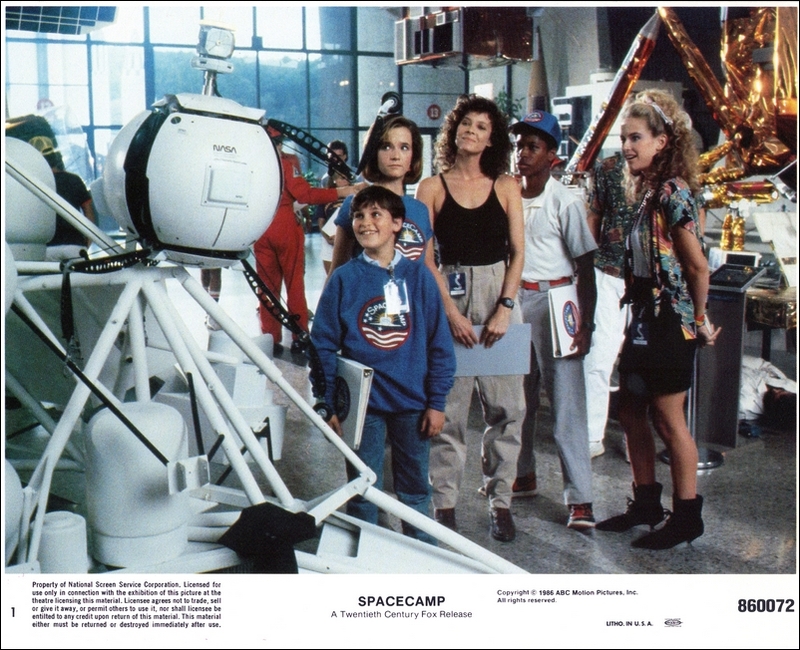 For five special teens, NASA's space camp promises to be a fun way to blow off the summer. 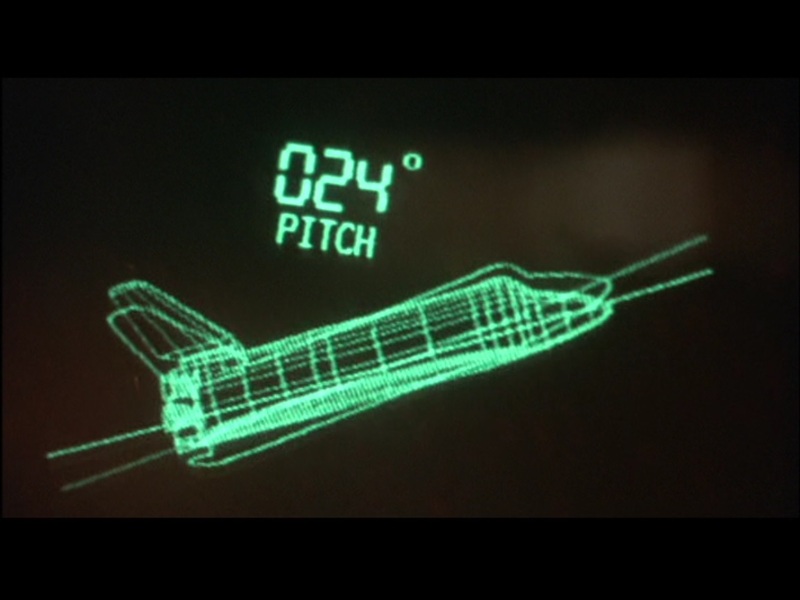 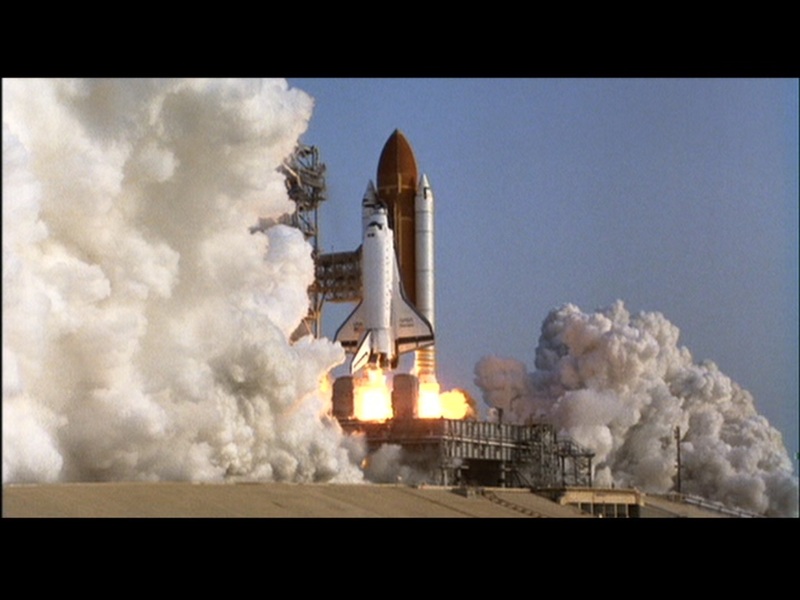 But when a space shuttle exercise misfires, they find themselves launched into orbit, facing the adventure of a lifetime. 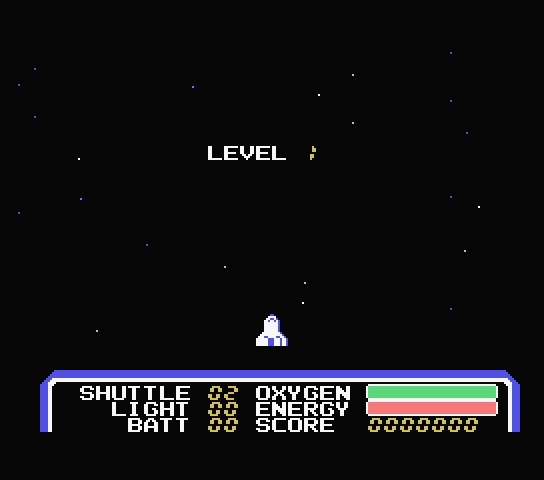 Now, the only way back to Earth is to take command of the ship and control of their destinies, before time - and oxygen - runs out! 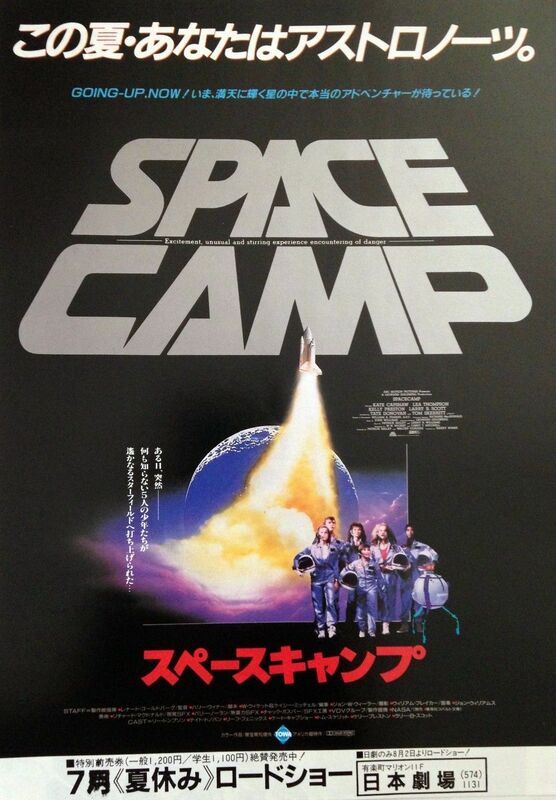 , or Supesukyanpu, is how SpaceCamp is represented in Japan. 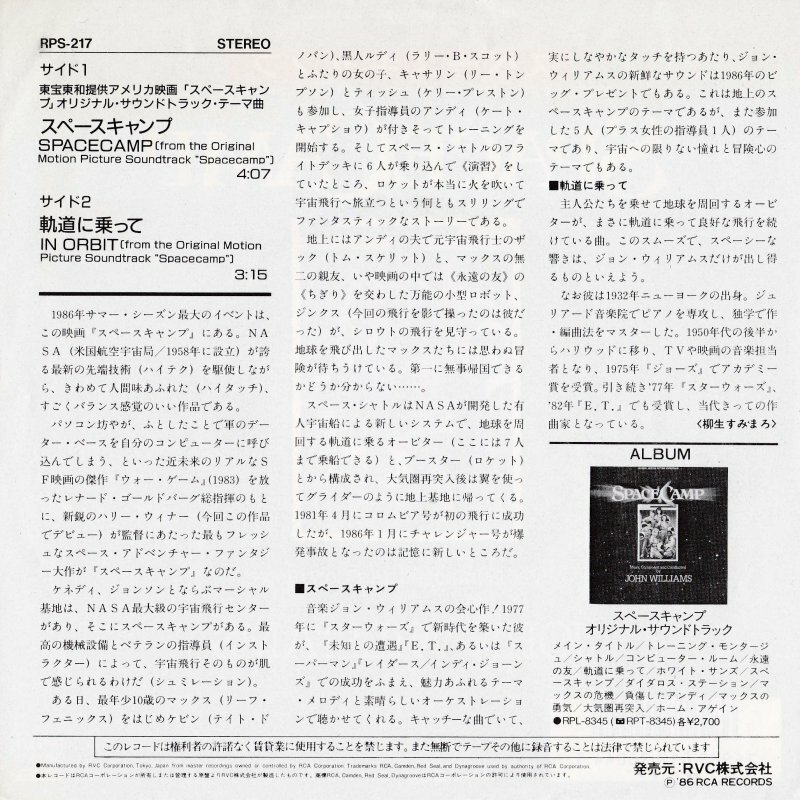 The Japanese market is quite unique, but not because the language is dominated by three unique character sets - Kanji, Hiragana, and Katakana. 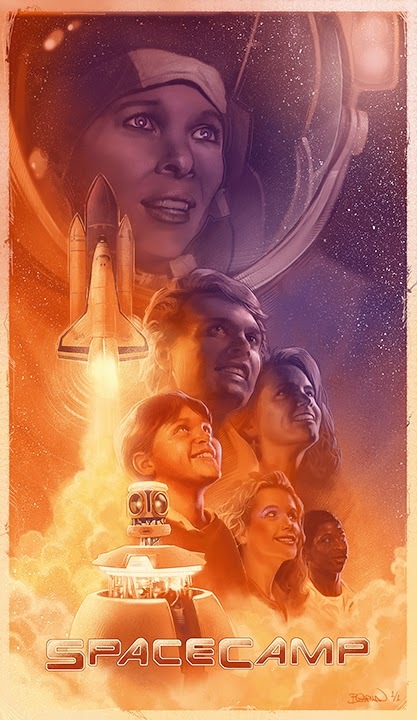 Rather, it's unique because the pop-culture there is on a much higher and stranger plane of existence than ours, and travels faster than the speed of light at all times. 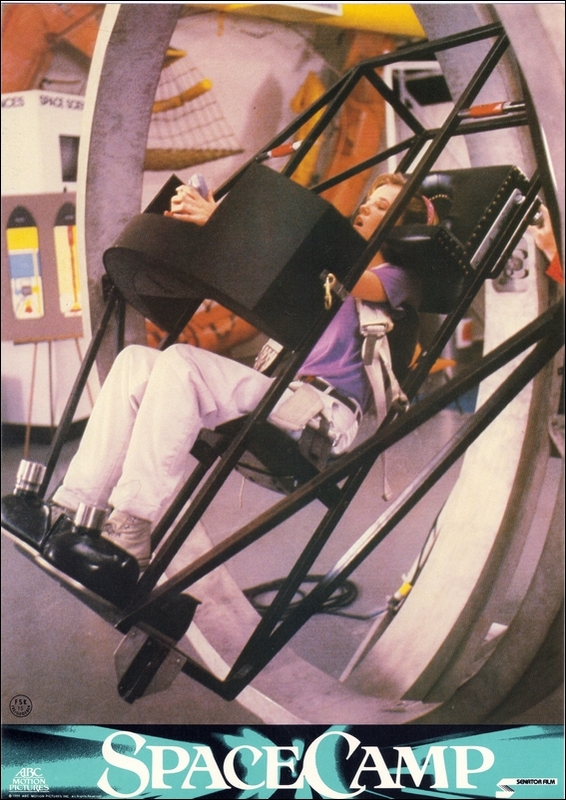 This results in some very unique offerings when it comes to goods offered to the masses. 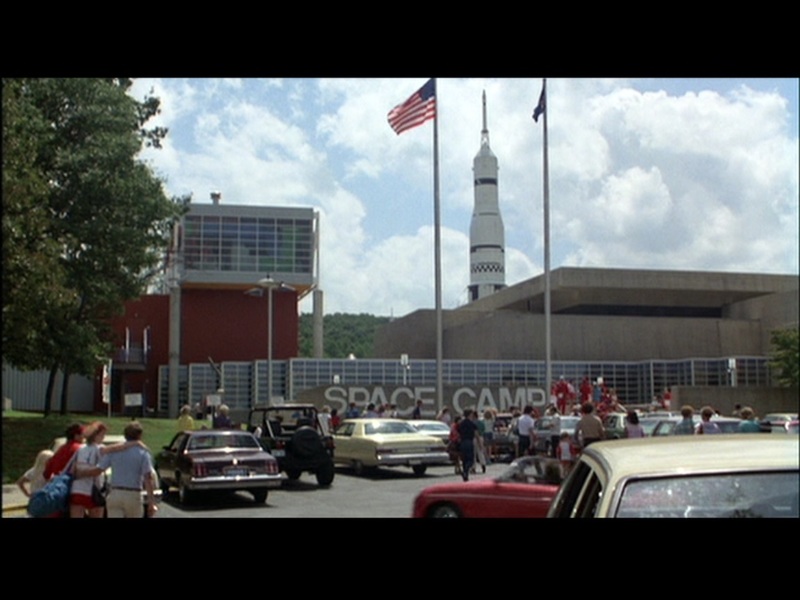 After all... you've got to get noticed; you've got to stick out. 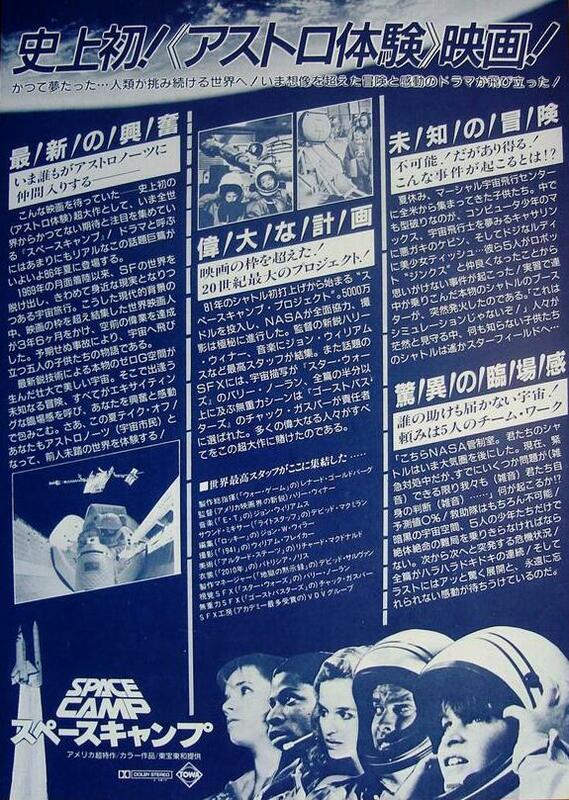 One item of note is are Chirashi: mini-posters / flyers used to advertise movies. 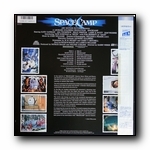 Movie flyers are often printed on high quality paper, and are usually a single sheet (2 sides) or 2-page "gatefold" (4 sides). 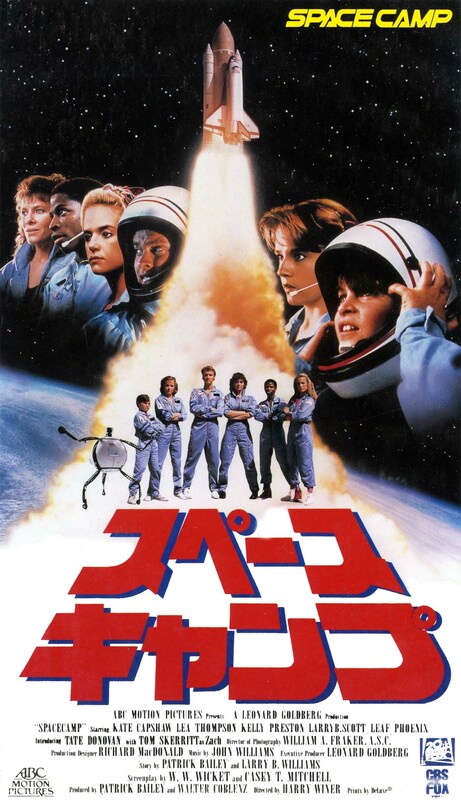 What's unique about Japanese movie posters is that much of the artwork is custom created for the Japanese market, with a distinctive Japanese design. 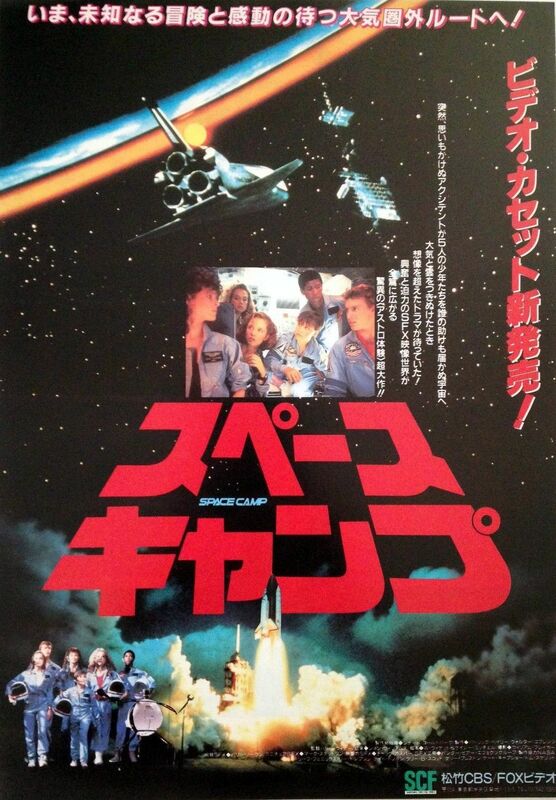 The Japanese poster will often look quite different to the artwork available in other countries. 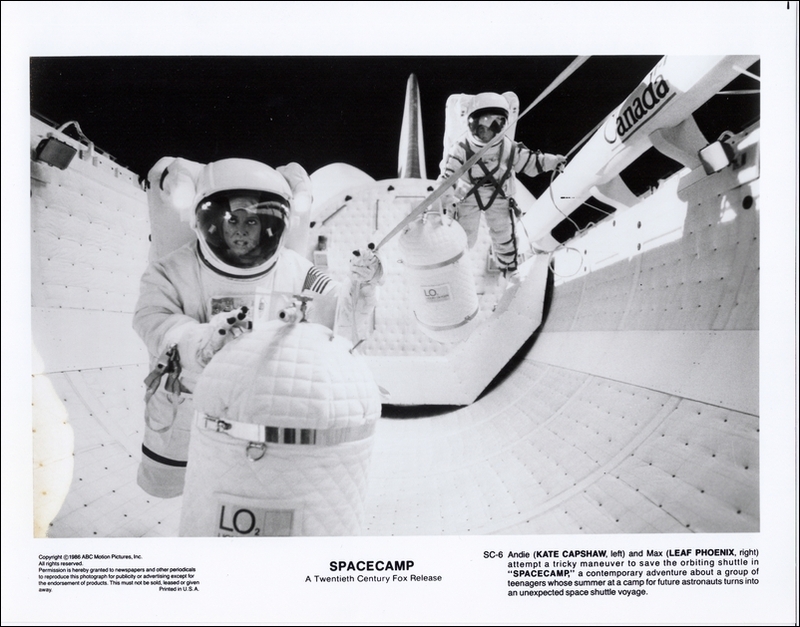 Some innovative releases include fold-out posters and specialty prints you won't find anywhere else. 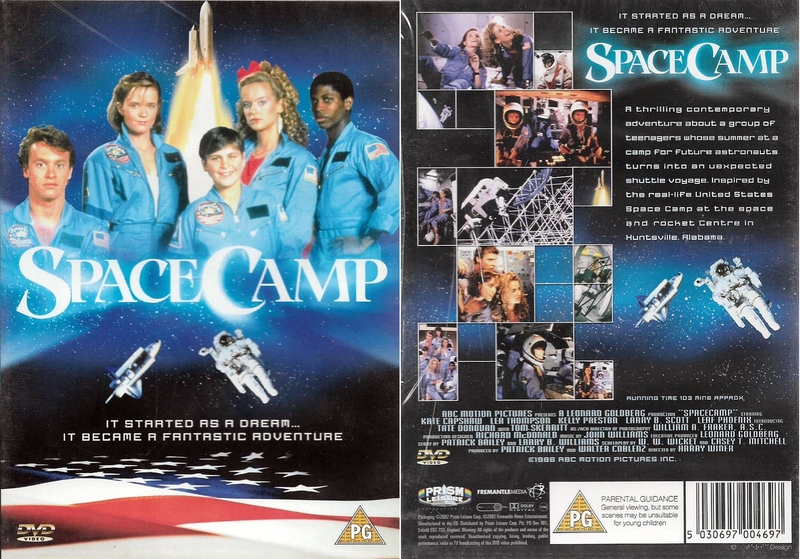 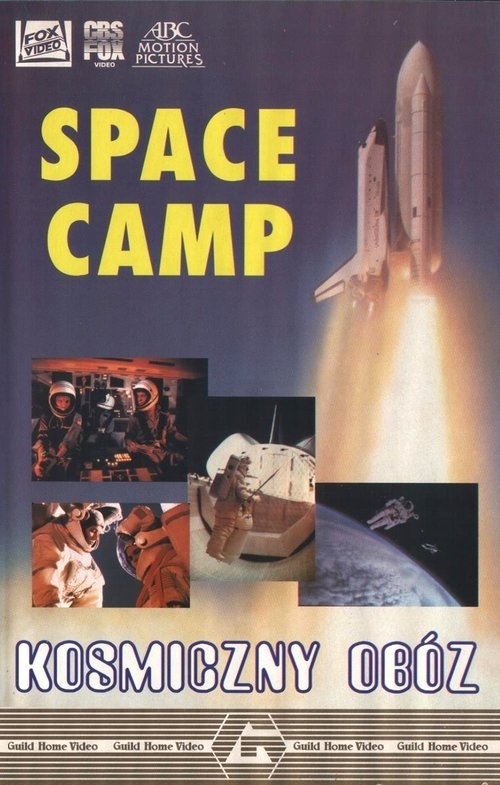 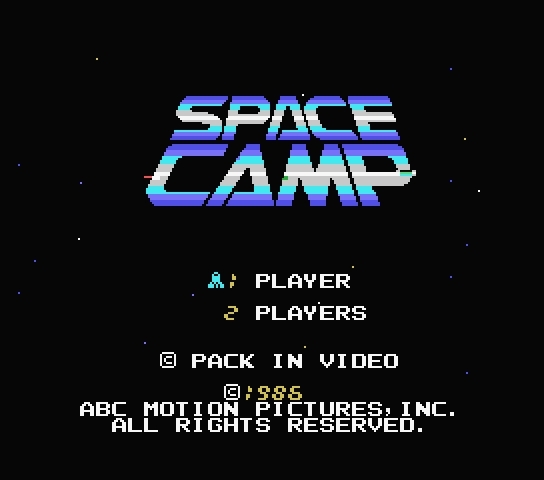 Although a Space Camp game was published for the Wii back in 2009, did you know there was a previously published game based on SpaceCamp: The Movie? 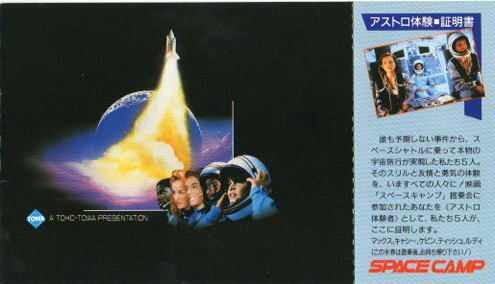 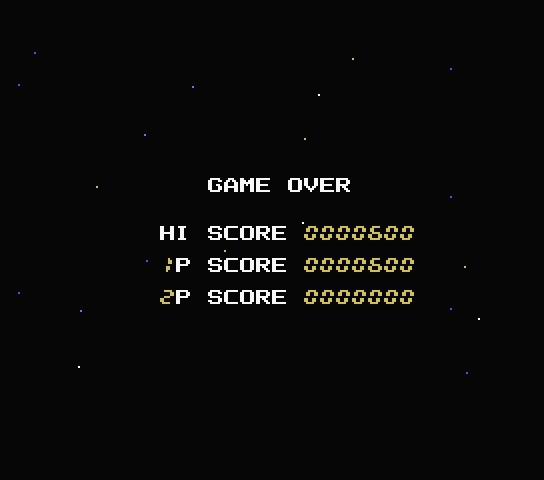 Developed and Published by Pack-in-Video Co., Ltd in Japan, this shoot'em-up top-down side-scroller is very loosely based on the movie. 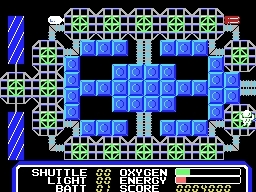 In fact, the only tie in is the name of the game itself. 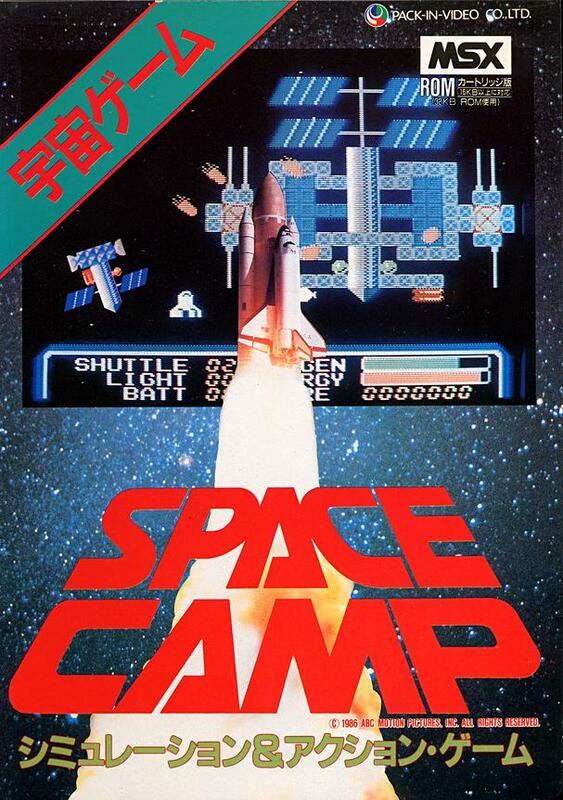 Here you guide your spaceship through orbit, avoiding meteor showers, military satellites and other obstacles. 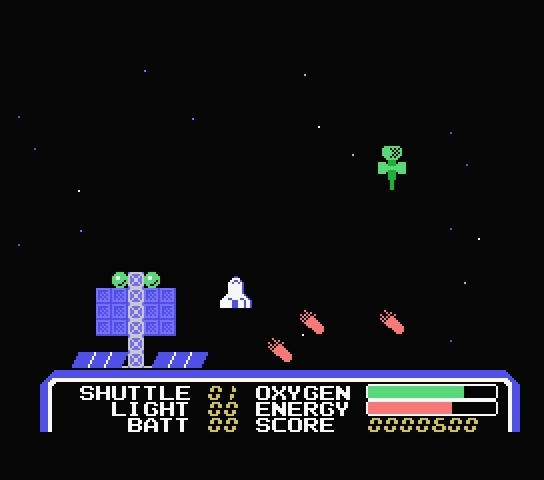 Since you have limited oxygen and energy reserves, you must pick up oxygen bottles and energy canisters from the space stations you fly past. 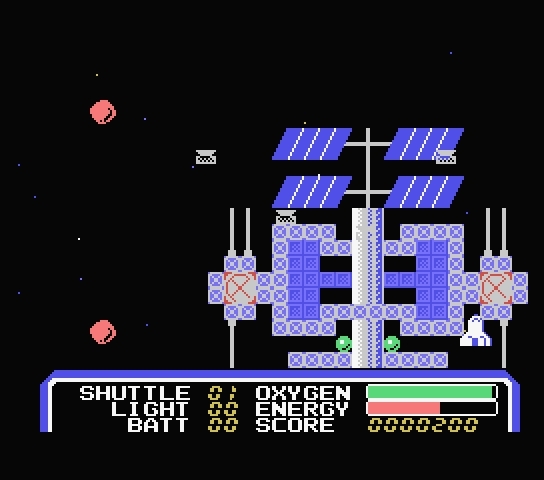 After a vertically scrolling space sequence, you jump out the ship and explore a space station. 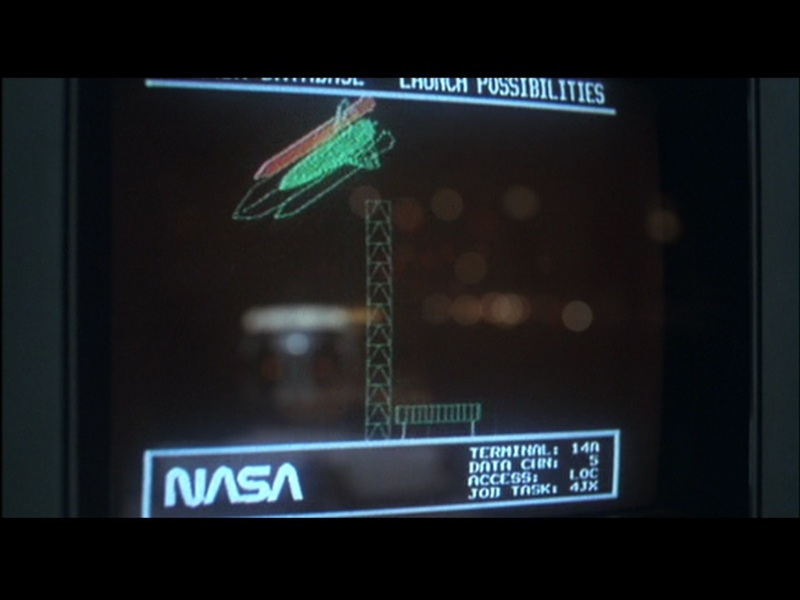 Apart from said resources, the space stations have hidden treasures hidden below certain panels. 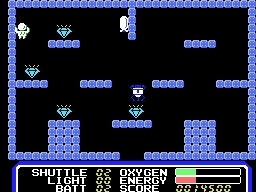 Find treasure by gliding across the panels and pushing the joystick button. 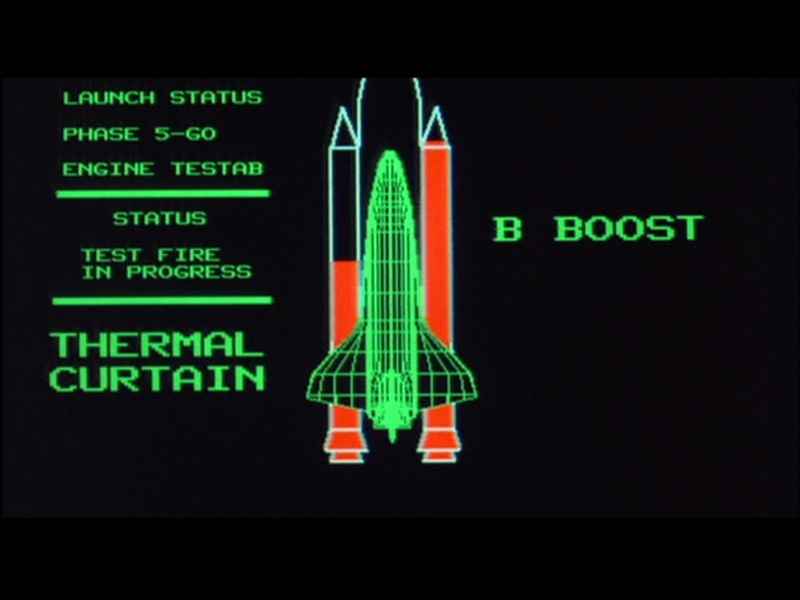 Certain panels will lead you to hidden treasure chambers. 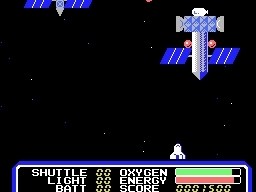 All the while, you must watch out for the space station's guardian. 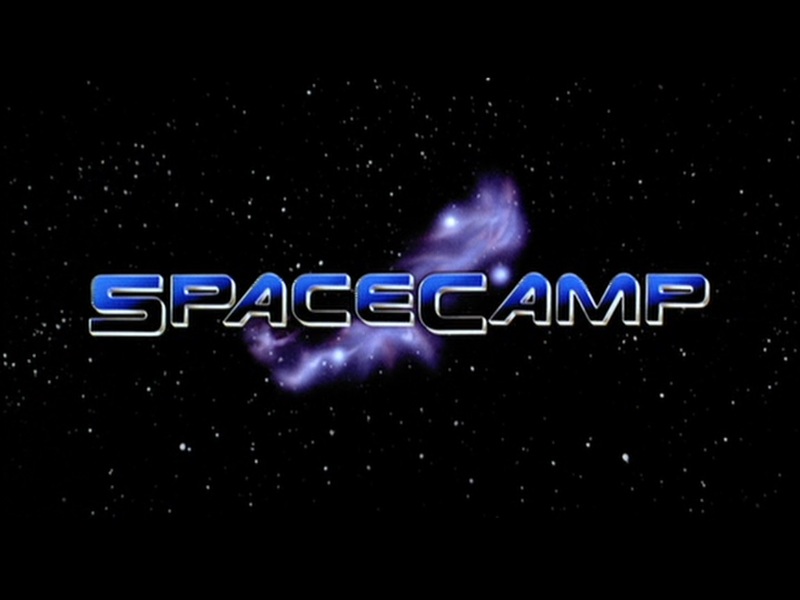 As I said... loosely based. 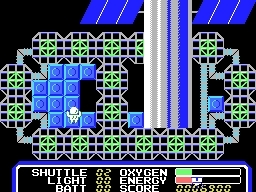 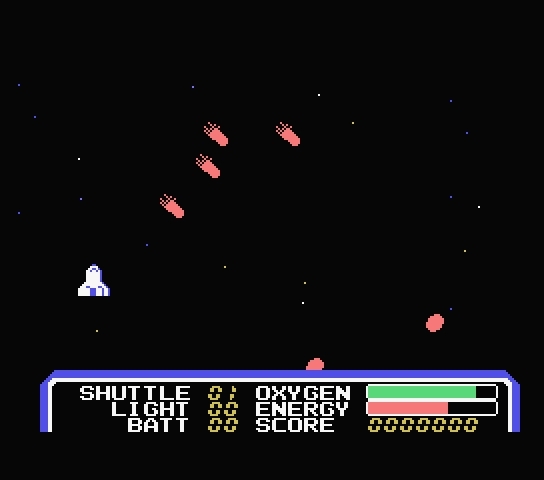 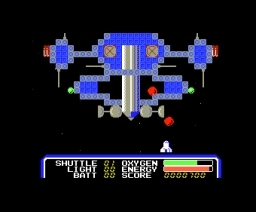 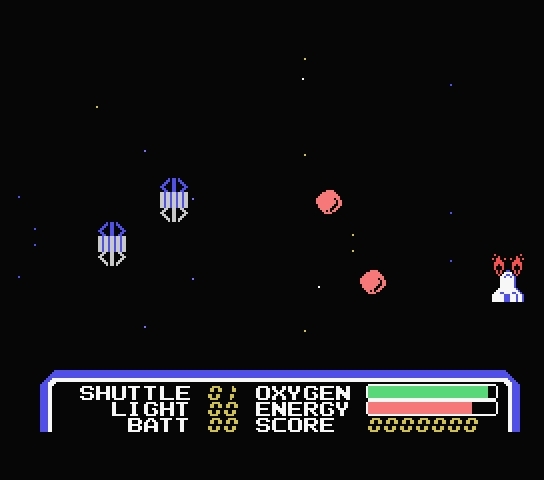 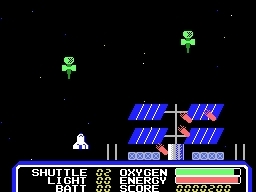 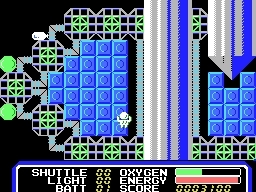 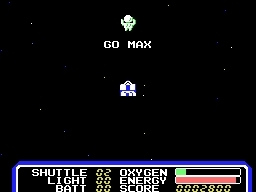 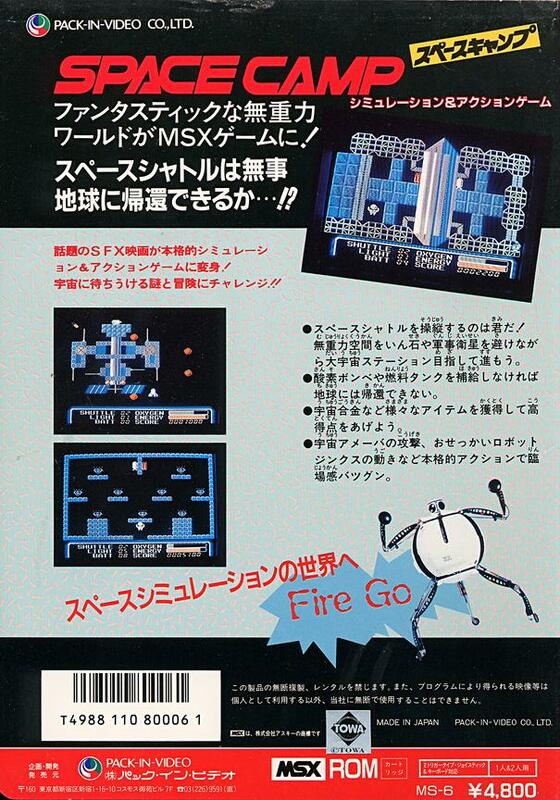 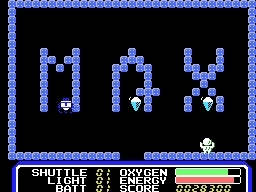 The game was published in 1986 for the MSX, a computer system developed by Microsoft as an attempt to create unified standards among various hardware makers of the period. 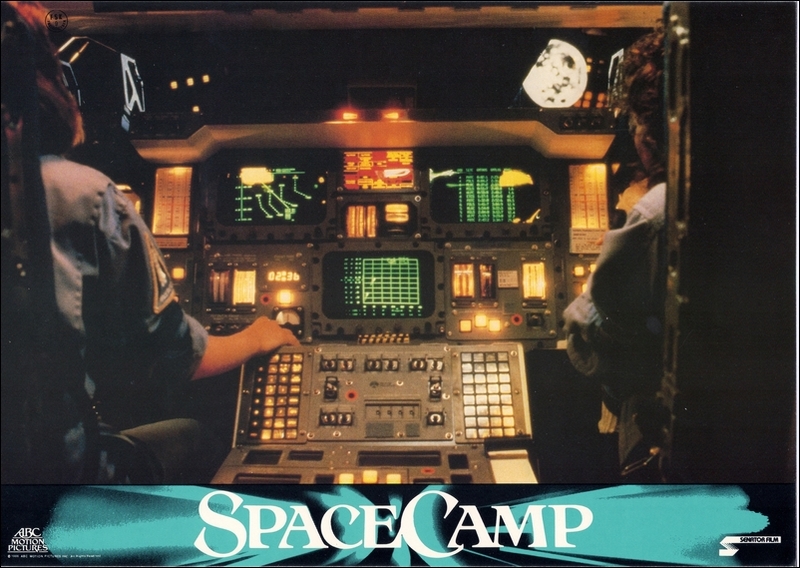 In the early 1980s, you see, most home computers manufactured in Japan featured a variant of the Microsoft BASIC interpreter integrated into their on-board ROMs. 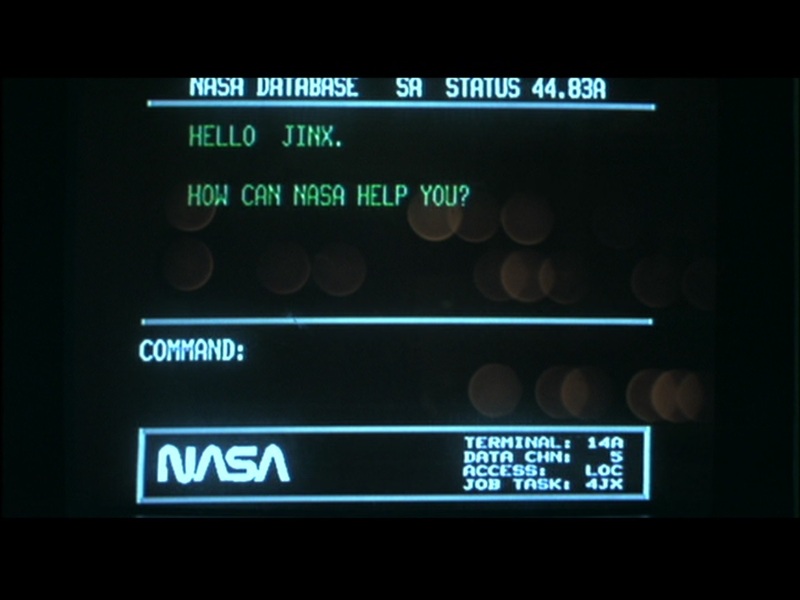 The hardware design of these computers and the various dialects of their BASICs were incompatible, thus MSX. 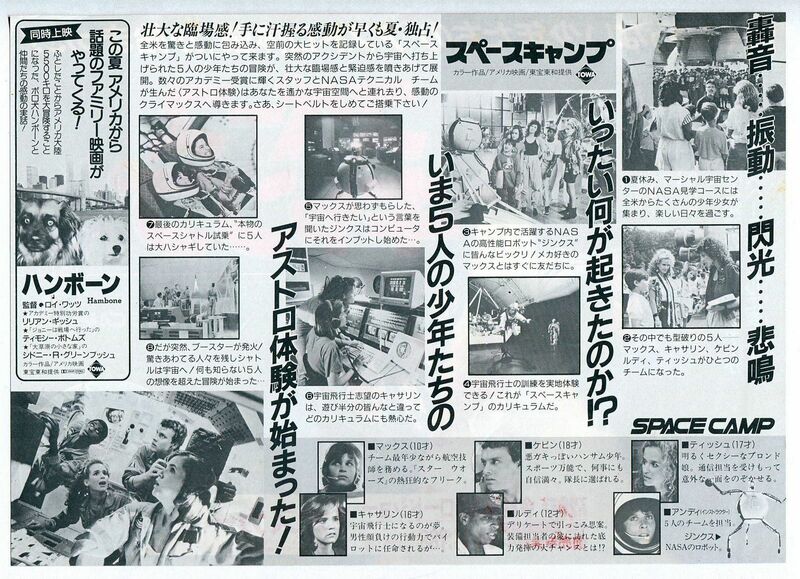 It was popular in Japan and several other countries, but mostly in Asia. 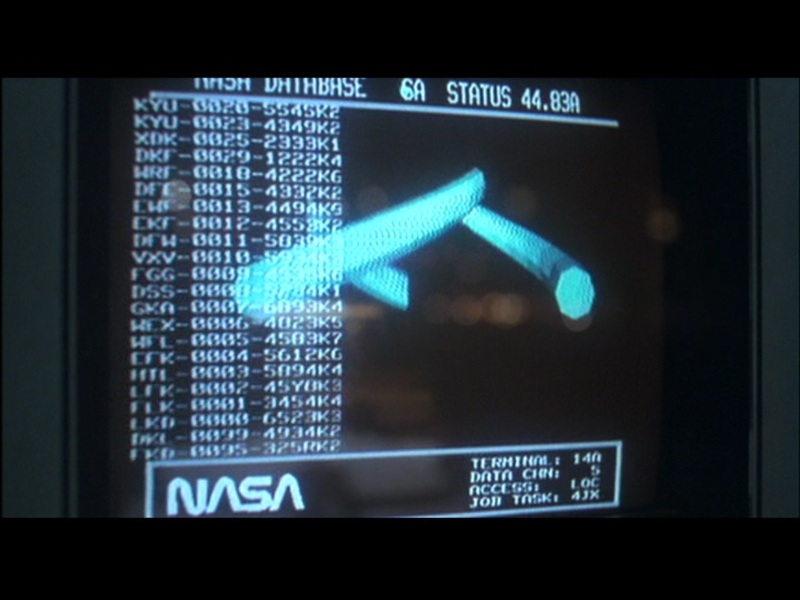 The following items presented here are of a miscellaneous nature. 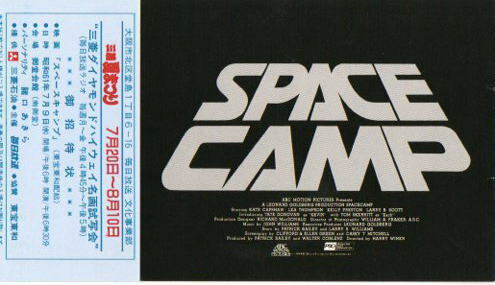 As you can see I have one of the original Space Camp patches featured in the film (there have been subsequent remakes of this patch on sale at Space Camp), a piece of an old Vestron video store advert for the film, two pieces of artwork found online, and two group photos - one more candid than the other. 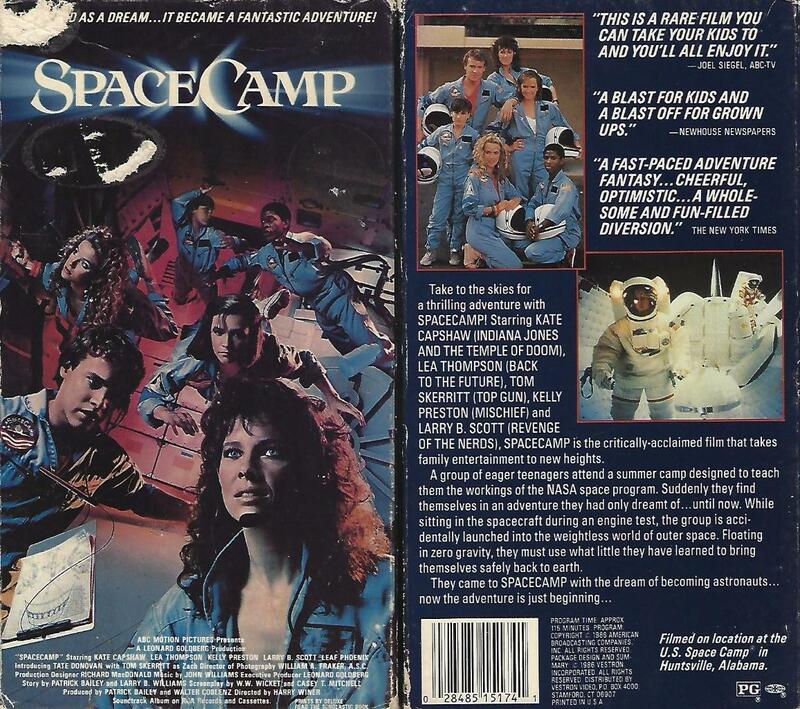 Additionally, Starlog #108, from July 1986, contains two articles - one about Camp and one about the Movie. 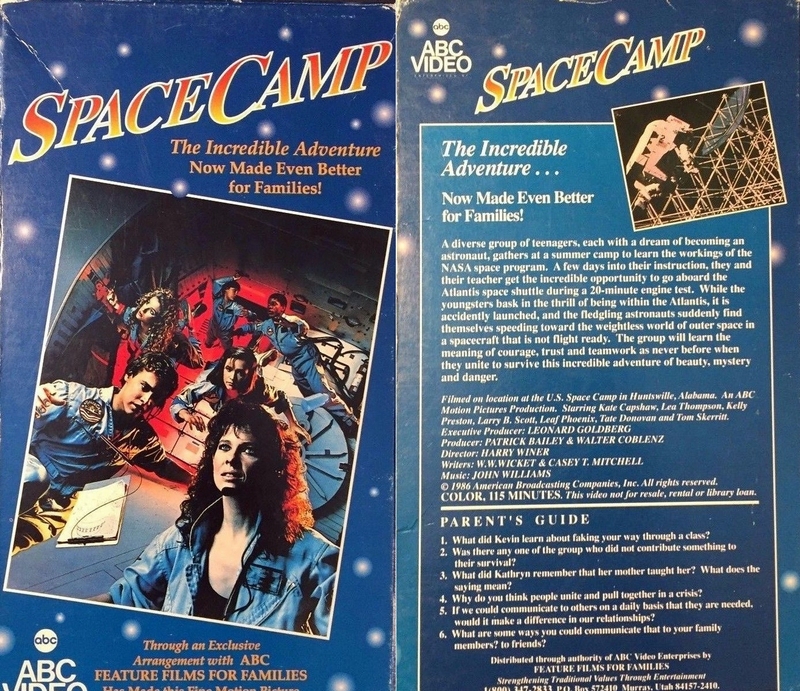 Starlog #109, from August 1986, also contains two articles: one about Camp itself, and an interview with Tom Skerritt who played Zach Bergstrom in the Movie.